2018 marks the 70th anniversary of the Universal Declaration of Human Rights, the 20th anniversary of the United Nations Declaration on Human Rights Defenders, and the 25th anniversary of the Vienna Declaration and Programme of Action. These instruments have been key to recognising fundamental rights globally and affirming the role that human rights defenders (HRDs) play in protecting these rights and ensuring sustainable and equitable development for all. While much progress has been made, HRDs face greater risk of retaliation and violence than ever before, especially those working in defence of land, environmental and indigenous peoples’ rights. While development interventions can be a powerful tool for the realization of human rights, too often activities undertaken in the name of development fail to adequately consider human rights conditions and impacts, and end up exacerbating the risks for defenders. In light of this, the Defenders in Development Campaign is calling on development finance institutions (DFIs) and their shareholder governments to ensure that development interventions support the realization of human rights and avoid causing or contributing to rights abuses, promote an enabling environment for public participation within development processes, and safeguard HRDs. Despite the growing awareness of the role of HRDs in sustainable development, the human cost of defending rights remains unacceptably high. Those working in defense of land, environmental or indigenous peoples’ rights—rights most often violated in the context of development and related investment activities—are most at risk. They are routinely subjected to stigmatization, labelled as “anti-development,” often quickly leading to criminalisation, threats and physical attacks. They are also more likely to be killed than defenders in other sectors. Since the adoption of the Declaration on Human Rights Defenders in 1998, an estimated 3,500 human rights defenders have been killed because of their peaceful work defending the rights of others. In 2017 alone, at least 312 human rights defenders were murdered, 67 percent of whom were working in defense of land and territory in the context of large investments, extractive industries and big business. For women defenders and other marginalized groups, the risks are even more acute. La principale préoccupation des participants à l’atelier était peut-être que ces décisions cruciales sur le développement se déroulent sans l’implication de la société civile et sans la contribution de ceux qui ont le plus d’intérêts en jeu, notamment les communautés pauvres, les peuples autochtones et les femmes. Les participants ont partagé divers cas d’investissements tels que ceux en Guinée, au Kenya et au Sénégal qui ont échoué dans l’implication des communautés locales et ont trop souvent alimenté les violations des droits humains et détruit les moyens de subsistance et les ressources naturelles des communautés locales. Les participants ont également examiné des cas positifs d’investissements conçus en partenariat avec les communautés locales et se sont questionnés sur la raison pour laquelle il n’existe pas plus de soutien pour ce type d’initiatives. 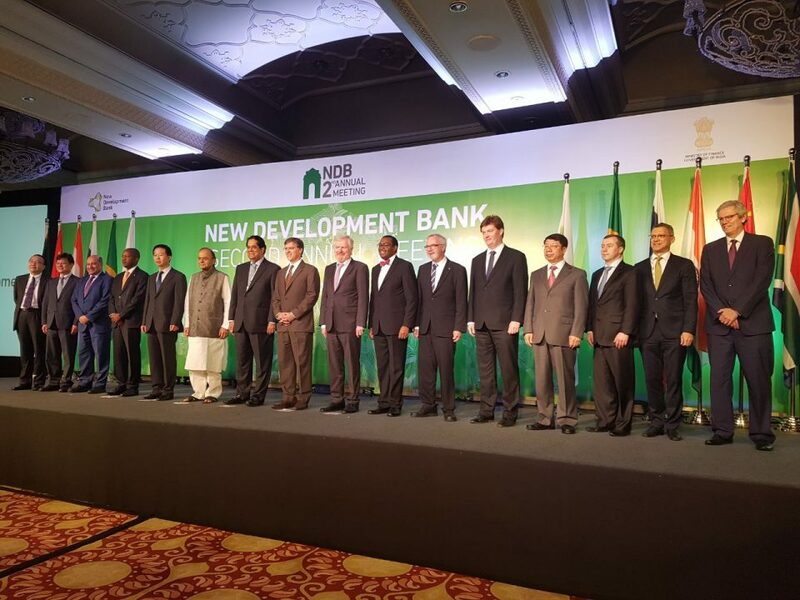 In April, the Boards of Governors and Directors of the New Development Bank (NDB), the multilateral financial institution established in 2015 by the BRICS countries (Brazil, Russia, India, China and South Africa), held their 2nd Annual Meeting, in New Delhi, India. During the meeting, BRICS finance ministers approved a five-year General Strategy as well as the process for admission of new members (the Bank plans to take in 15 new member countries in a first phase); while the Board of Directors discussed the Bank´s project pipeline. In addition, the Bank signed Memorandums of Understanding (MOUs) to promote cooperation with five different Multilateral Development Banks, including the Asian Infrastructure Investment Bank (AIIB) and the European Investment Bank (EIB). K.V. Kamath, the NDB´s president, also announced the plans of the Bank to fund 15 infrastructure projects in member countries worth up to 3 billion dollars, and to raise funds by issuing rupee-denominated bonds in India, after it issued yuan-denominated bonds in China last year. While the Bank showed its commitment to advance further on its institutionalization and to broaden its membership, civil society from around the world raised concerns over the Bank´s approach to development. A strategy for sustainable and inclusive development? In side events and meetings with representatives of the bank, human rights and environmental advocacy organizations from around the world called on the Bank to set forth concrete commitments and criteria for sustainable development. In a docu ment titled The BRICS New Development Bank Strategy. A civil society perspective for truly sustainable infrastructure and transformative development cooperation, groups identified five priority areas and key recommendations. According to the proposal, ‟in order to promote a new kind of development and to really assist marginalized populations or unserved areas and respond to unmet needs in the developing world, the NDB will have to shift from a ˈdo-no-harmˈ approach, towards an emphasis on developing projects that explicitly aim to generate positive social and environmental impacts, including social infrastructure (housing, education, sanitation, health, food and nutrition security, culture among others), off-grid energy solutions, and other projects targeted to meet the needs of vulnerable communities.” It also states that ‟the activities of the Bank should be geared toward supporting sustainable patterns of consumption and production, and inclusive, transformative strategies of growth”. While civil society groups in March sent a letter urging the Bank to open a meaningful consultation process with civil society and other stakeholders before approving the final version of the Strategy, on April 1st the Board of Governors approved, in principle, the Bank’s General Strategy. The final Strategy document is expected to be made public in early June. An effective environmental and social framework? As the NDB prepares for the one-year review of its Environmental and Social Framework (ESF), civil society organizations raised concerns regarding the ESF’s failure to actually operationalize its sustainability aspirations. Include clear sustainability criteria and due diligence requirements for project selection, supervision, and implementation. Clarify and strengthen the role of NDB staff in assessing projects and supervising and monitoring implementation and compliance. Put in place clear benchmarks and systems for assessing and supporting country and client capacity, especially where country or client systems are utilized. Set out time-bound requirements for disclosure and consultation to ensure that affected communities and civil society groups have access to information and are able to meaningfully participate in NDB-financed activities. Signatory organizations also urged the Bank to establish a formal, inclusive, transparent, and robust consultation process on the ESF and other existing and future policies and strategies. Is the NDB any different from other traditional IFIs? On the sidelines of the Annual Meeting, the Peoples’ Forum on BRICS, a network of peoples’ movements, trade unions, national networks and civil society organizations, held a day-long event on 30th March, bringing together environmentalists, journalists, indigenous communities and other civil society representatives from the BRICS countries. In the New Delhi Declaration, participants raised deep concerns that the NDB is merely replicating existing International Financial Institutions, which suffer from a lack of transparency, accountability, and spaces of engagement with civil society and peoples’ movements. The document concludes that ‟the New Development Bank has to step back and reconsider why indeed it was established. In so doing, NDB must pro-actively reach out to peoples movements, trade unions, civil society organizations and peoples networks genuinely working with poor and impacted communities”. What kind of engagement with civil society does the Bank intend? Civil society representatives from the Coalition’s BRICS working group had the opportunity to meet with different NDB Vice-Presidents and officials in different events held in the sidelines of the Second Annual Meeting in Delhi, such as a Multistakeholder Dialogue organized by Oxfam and Vasudha Foundation and meetings between NDB officials and CSO representatives. In those meetings, the Bank´s officials expressed the intention of the institution to “expand and deepen its interaction with all stakeholders of the Bank, including with representatives of civil society and scholars”. At the same time, it is worth noting that the Bank´s alleged openness and intention to foster its interaction and engagement with civil society is at least contradictory with its absence of transparency or consultation to date. 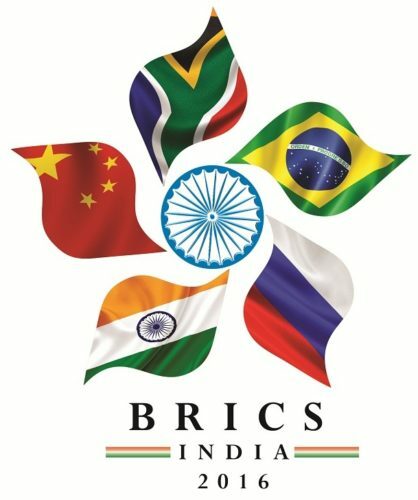 Civil Society in both BRICS and non BRICS countries are still demanding the Bank promote a truly robust and effective engagement with civil society, which allows meaningful participation and listening to different stakeholders, especially to communities and grassroots groups affected by the Bank´s projects. The outcomes of the 2nd Annual Meeting of the NDB show the Bank´s clear intention to continue growing and expanding in terms of projects, disbursements and even members. This is a natural process for a new institution that is just two years old and that was born with the aim of financing infrastructure and sustainable development in emerging market and developing countries. It is worrying, however, that in this process the NDB seems to be replicating the same mistakes that were made in the past by other development financiers creating doubts over what is truly ‟new” in the BRICS New Development Bank. On the way to its third year of operations, the NDB must carefully consider which should be the proper and most suitable strategy to fulfill its mission of supporting infrastructure and sustainable development efforts in BRICS and other emerging economies. Ramping up investments without clear sustainability criteria or meaningful engagement with civil society, would be a strategy for failure. Gretchen Gordon coordinates the Coalition for Human Rights in Development, a global coalition of social movements, civil society organizations, and grassroots groups working to ensure that all development finance institutions respect human rights. Originally posted by Accountability Counsel on May 24, 2017. We have cases all over the world, representing diverse communities with vastly different life experiences, yet all of Accountability Counsel’s cases present this same basic pattern: powerful actors – governments, companies, banks – exclude community voices from “development” projects, predictably leading to serious harm. Thus, in Colombia, children like 10-year-old Gabriela Acosta are suffering from hearing loss and related learning disabilities because operators and financers of Bogotá’s El Dorado International Airport have refused to listen to community demands to implement basic noise mitigation. In India, the World Bank Group’s International Finance Corporation invested in Assam’s tea plantations despite freedom of association violations that have helped perpetuate seriously exploitative conditions for workers that have not changed since communities were forcibly brought from central India over 150 years ago. The list goes on and on. 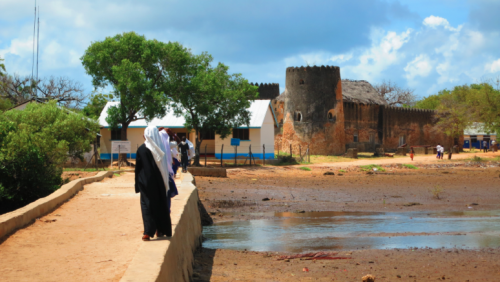 Lamu is home to a UNESCO World Heritage site marked as the oldest Swahili settlement in East Africa. It hosts a remarkably pristine, rich ecosystem, including 70 percent of the country’s mangroves. Communities in Lamu are facing what National Geographic has described as an “existential crisis” – construction of a $2 billion coal-fired power plant, the first in East Africa. The coal project poses risks to public health and to Lamu’s marine environment, threatening the livelihoods of those involved in Lamu’s two most important industries: fishing and tourism. The Kenyan government is also planning to build a massive port and an oil and gas pipeline in Lamu, which pose their own social and environmental risks. The African Development Bank (AfDB) is in the background of each of these projects: considering a partial risk guarantee for the coal plant; providing a grant to accelerate development of the port; and potentially considering support for the pipeline. This pause in construction is critical because public awareness about the project – perhaps by design – is low. 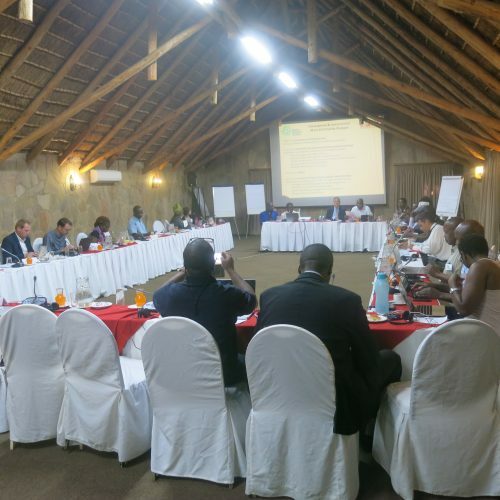 Kenyan authorities held their public hearings on the project in an inaccessible location. In community consultations, the company has emphasized project benefits (the credibility of which are questionable), avoiding detailed responses to questions about negative impacts. While construction is halted, Lamu communities have a chance to learn about the coal plant’s livelihood, health and environmental risks. Who is the Coalition for Human Rights in Development? 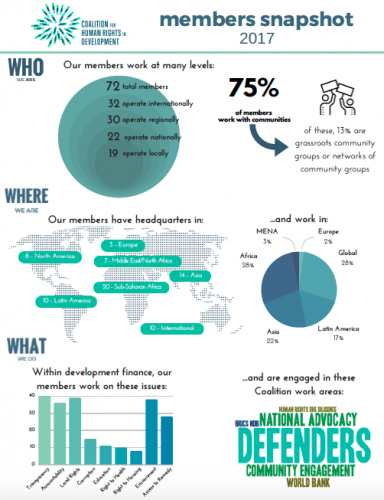 The Coalition has 72 members all around the world doing amazing work to protect human rights and to hold development financiers accountable for their impacts on communities. We recently surveyed our members and produced this snapshot of who our members are and what they do. Originally posted on Amphibious Accounts: Human Rights Stories from the Global South, on March 1, 2017. Every month a mandatory percentage for the retirement fund is deducted from my bimonthly payment, which is part of the Mexican social security system. The same applies to the 21 million economically active people and with social benefits, as in Mexico about 58% of the employed population (28.7 million) work in places that elude registration with social security, meaning that they do not offer any benefits to guarantee health care, medical care and to ensure a livelihood, among others. Although not all the economically active population of the country participates in savings for pensions, we are talking about a large amount of public money that until a couple of decades ago was managed by the state. Today, after a series of reforms to the Law of Savings Systems for Retirement, this money went from being administered by public to private entities and is being used to finance infrastructure projects such as roads, hydroelectric plants, and energy projects to just mention a few. These projects put at risk the savings invested without the taxpayers being aware on the one hand, and on the other, in many occasions – to not say all of them – violate human rights and increase the inequality gap in the country. For example, the conversion project of the Cerro de Oro dam to a hydroelectric plant in the state of Oaxaca would use retirement savings without taxpayers having mechanisms to know in what kind of projects our money is being invested and what their impacts are. In addition, the project entails severe impacts on the territory and violations of the rights of the Chinantec and mestizo communities of the region. At the end of the 1980s, the Mexican pension system was in charge of the Mexican Social Security Institute (IMSS) and had a more guarantor scheme of distribution and defined benefits. However, in the early 1990s, the ratio of active to retired workers decreased significantly, among other things, as a result of an increase in life expectancy and declining birth rates. This was the perfect excuse for the country to begin adjusting itself to the recommendations of the Organization for Economic Cooperation and Development (OECD) and transforming pension funds into a tool for financial markets and a permanent source of long capital term. Over the last few years, various reforms have been made to change the scheme of the pension system, to relax the restrictions on the investment of these funds, allowing more investment in instruments that benefit the private sector and are administered by the latter through Retirement Fund Managers (Afores), the private financial institutions in Mexico that manage retirement funds and through which everyone has to manage their funds for retirement. That is, private entities in charge of public resources. Currently the pension funds represent 13.6% of the gross domestic product of Mexico, which are invested in projects with high risks such as capital investments (34.6%); infrastructure (30%); real estate (23%); energy (5.2%); forestry (4.1%); and financial services (3.1%). In order to invest public funds in these projects, the government has created mechanisms that are very technical and difficult to monitor (such as certificates for capital development – CKD) and which benefit the private sector. These mechanisms reduce the risk for the sector as we as taxpayers assume the risk without knowing it. This is not something that happens in isolation in Mexico, but represents a global trend. In recent years, representatives of governments and the private sector have come to a consensus that infrastructure is one of the main pillars for development and global economic growth. The argument is that investment in infrastructure is an opportunity to promote sustainable and inclusive growth. Currently, some estimate that total spending on infrastructure is $2-3 trillion dollars a year and that an additional $4 trillion annually until 2030 will be required to cover infrastructure needs. Much of this amount is planned to be covered through large pension funds from countries such as Australia, Canada, Brazil, the United States, the Netherlands, and Chile, to name a few. In this way, the construction of the Cerro de Oro hydroelectric project was planned on indigenous territory and work began without having consulted and obtained the consent of indigenous peoples. This would have had irreversible environmental impacts and involve the resettlement of hundreds of people. Furthermore, the energy production had been previously granted to various private companies, as well as the returns. The project did not guarantee the right to energy, a healthy environment, water, and participation to decide over the community’s own development, among others. Part of the financing came from the savings of Mexican taxpayers, without them being aware of it. Also, part of the financing of a wind farm in Juchitan, Oaxaca has been highly controversial for reasons similar to those mentioned above; it comes from the Dutch pension funds without people knowing it. And it is not only a question of using these public resources without the knowledge and consent of the owners in projects that violate human rights, but we as the taxpayers assume the financial risk of projects, which completely benefit, once again, entrepreneurs. Mexico’s National infrastructure Program states that infrastructure investment is a strategic issue and priority for Mexico because it represents the means of generating economic growth and development and is the key to increasing competitiveness. One of the challenges of the program is funding, providing a total investment of 575 billion through 743 projects. The government has planned that at least 37% of this funding will come from the private sector. One of the incentives for the latter to invest in the project portfolio is the retirement savings system reforms. Currently, there is a need to make the use of these resources transparent, so that the projects in which money is invested can be monitored, as well as to inform taxpayers about the use of the resources that we compulsorily pay twice a month, every single month, and with which markets speculate. Do you have savings in pension funds? Do you know what they are being invested in? 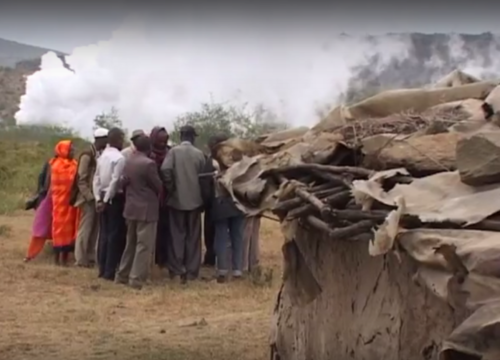 On February 16, the World Bank Board is scheduled to review a proposed Action Plan to remedy harm caused to four Maasai villages which were resettled in 2014 to make way for the Olkaria IV geothermal development in Kenya’s Rift Valley, a project financed by the World Bank, the European Investment Bank, and the German development bank, KFW. The Action Plan follows an investigation by the Inspection Panel, the World Bank’s independent accountability mechanism, which found a lack of compliance with World Bank policies, especially the failure to trigger the Bank’s Indigenous Peoples Policy. 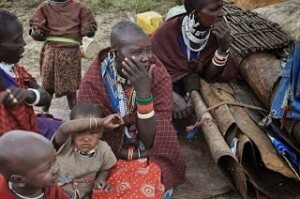 This disregard for bank policies led to significant harm to indigenous Maasai villages. In May of 2016, a mediation process with the implementing agency, the Kenya Electricity Generation Company (KenGen), concluded in a Mediation Agreement, yet the vast majority of KenGen’s commitments remain unfulfilled. Community members are pressing for the World Bank to ensure that KenGen satisfy its commitments, and that additional measures be taken to remedy the harms caused to the resettled communities and to bring the project into compliance with the Involuntary Resettlement and Indigenous Peoples policies. The history of this project shows a continuing lack of will on the part of KenGen to comply with World Bank policies and a lack of adequate supervision and monitoring by the World Bank. If the Bank had properly applied its Indigenous Peoples Policy, communities would have been safeguarded from many of the subsequent project failures. Instead the Bank even granted additional financing to the project in June of 2016 without addressing any of the compliance issues. This lack of adherence to protections for indigenous peoples is a growing problem at the World Bank – one that threatens the rights of indigenous peoples around the world and their ability to benefit from development. As one community member said, “the banks financing this project should give the project affected people their rights, and also they should be keen when they give out their money not to destroy life of people”. See a video of community members here. 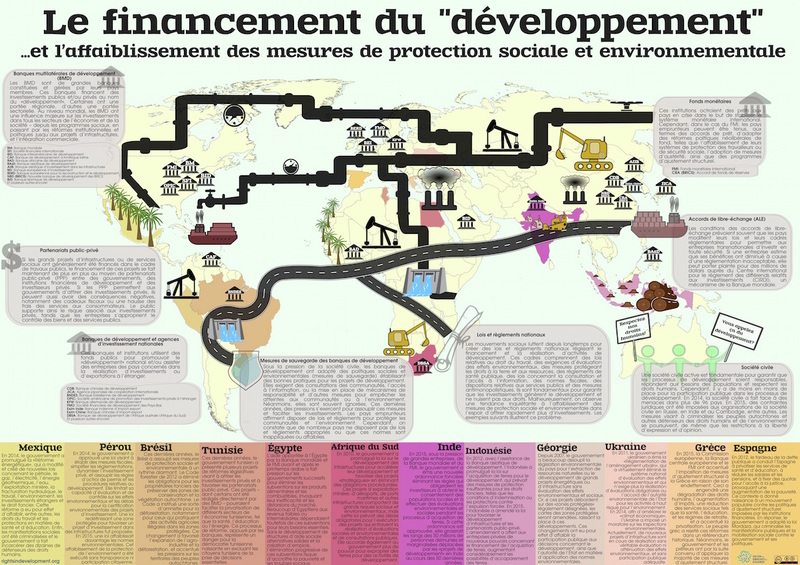 Cette infographie produite par la Coalition pour les droits humains dans le développement conjointement avec Otros Mundos et Movimiento M4 explique l’histoire complexe du Financement du “développement” et de l’affaiblissement des mesures de protection sociale et environnementale ayant actuellement un impact sur les communautés dans le monde entier. De nos jours, les gouvernements et les grandes banques de développement investissent des milliards de dollars dans des projets liés aux infrastructures, à l’énergie et à l’agriculture, au nom du développement. Mais au lieu de concevoir des projets pour répondre aux besoins et aux priorités des communautés pauvres, ces projets de développement sont trop souvent conçus pour maximiser les bénéfices des entreprises. Sans mesures de protection solides pour s’assurer que les communautés locales et les groupes marginalisés soient consultés et que leurs droits humains soient respectés, les projets de développement peuvent aboutir à l’expulsion des communautés ou le pillage de leurs ressources naturelles. Nombre des grandes banques de développement ont des politiques de sauvegarde sociale et environnementale pour assurer que leurs investissements ne causent pas de dommages. Mais trop souvent, ces politiques ne sont pas appliquées. Certaines banques affaiblissent leurs mesures de sauvegarde et s’appuient uniquement sur les lois nationales des pays dans lesquels elles investissent. Parallèlement, dans le monde entier, les gouvernements réduisent ces mesures de protection sociale et environnementale, c’est le cas par exemple des lois du travail et des règles d’octroi des licences dans le domaine de l’environnement, afin d’attirer les investisseurs et d’accélérer le “développement”. Les gouvernements utilisent des partenariats public-privé afin de privatiser des biens et des services publics de manière efficace. Les banques de développement encouragent et facilitent même l’affaiblissement des lois nationales. Plus encore, les entreprises utilisent les accords de libre-échange et des tribunaux tenus par la Banque Mondiale pour défier les lois et les réglementations nationales menaçant leurs profits. Les communautés et les groupes de la société civile se sont battus fermement pour pousser les gouvernements nationaux et les banques de développement à élaborer des lois et des mesures de sauvegarde pour protéger les droits humains et l’environnement. Mais maintenant lorsque des communautés se battent pour défendre leurs droits humains face à des activités de développement néfastes et l’affaiblissement des mesures de protection sociale et environnementale, elles peuvent être victimes d’intimidation et de violentes répressions. Les gouvernements limitent de plus en plus les possibilités pour la socitété civile de participer aux processus de développement et d’intervenir dans leur élaboration. Le financement du “Développement” nous explique comment 12 pays ont, au cours des dernières années, affaibli des mesures nationales de protection sociale et environnementale afin d’attirer les investisseurs. Il présente les nombreuses banques de développement nationales et multilatérales et autres institutions financières qui non seulement encouragent les investissements dans le développement, mais dans de nombreux cas facilitent aussi l’affaiblissement des cadres réglementaires du monde entier. L’objectif est de montrer en quoi ces différents acteurs et processus sont tous liés -comment la construction de méga-barrages au Brésil et la privatisation des services publics en Tunisie sont liés à l’affaiblissement des droits fonciers en Inde, à la réduction des mesures de protection environnementale en Afrique du Sud, et aux répressions contre la société civile au Mexique. Si nous comprenons le contexte mondial du Financement du “développement”et l’affaiblissement des mesures de protection sociale et environnementale, nous pouvons mieux voir en quoi nos différentes luttes sont en fait étroitement liées. C’est ainsi que nous pouvons nous battre non pas pour changer un seul projet de développement, mais pour provoquer un nouveau modèle de développement– qui puisse répondre aux besoins et aux priorités des communautés pauvres et des groupes marginalisés, et qui respecte les droits humains et préserve notre environnement. L’infographie est disponible en téléchargement en anglais, espagnol, français et portugais et peut être imprimé en format affiche A2 ou A3. This week, as we celebrate Women Human Rights Defenders Day, November 29th, we honor the courageous work of women defenders around the world fighting for their human rights and their communities. Women defenders are on the front lines of the struggle for sustainable, equitable development. They run agricultural cooperatives and deliver health and education services. They raise their voices, organize, and mobilize to shape development proposals and to fight against ill-conceived investments that threaten the well-being of their communities. For this work, they face discrimination, threats, intimidation, sexual violence, detention, and even death. 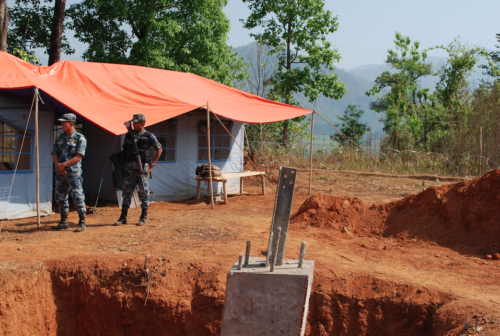 The World Bank and other development banks are ramping up investments, especially private sector investments, in Burma/Myanmar and other “fragile and conflict affected states”. While the banks acknowledge that sustainable development requires human rights principles like transparency, access to information, public consultation, and accountability, they haven’t seriously grappled with how to ensure these principles are followed in environments where public participation and fundamental freedoms of expression and assembly are severely restricted. According to research by Global Witness, some of the fiercest attacks on women and other human rights defenders occur in the context of development investments. Governments often clampdown on human rights in an effort to curtail potential opposition to development projects. As a Human Rights Watch investigation revealed, when communities speak up, they are labeled “anti-development” and subjected to threats, harassment, and violence at the hands of authorities or public and private security forces. Moon’s story demonstrates why it is critical for development finance institutions like the World Bank and the Asian Development Bank to ensure that there is an enabling environment for human rights and public participation around their investments. In their social and environmental impact assessments, development banks should be assessing differentiated impacts on women and girls and identifying risks to women defenders, which may be different than the risks faced by men. They should ensure that their investments aren’t causing, contributing to, or exacerbating human rights abuses. And where threats arise, they should have protocols in place to protect defenders and to minimize and remedy any harm. Around the world, women are doing the heavy labor of sustainable development every day. It’s time for development financiers to ensure that women can participate in development processes and raise concerns about development proposals without putting themselves in danger. It’s time for development financiers to safeguard women defenders. You can learn about the campaign to get development financiers to safeguard human rights defenders and read the rest of Moon’s story at www.rightsindevelopment.org/hrd. Sur le continent africain, le « développement » est un secteur important. Les banques qui financent les routes, les projets énergétiques et agricoles ont une incidence majeure sur les gouvernements et les entreprises. En tant que tel, ces experts financiers du développement peuvent jouer un rôle déterminant au moment de décider si les activités de développement soutiennent la mise en oeuvre des droits humains ou facilitent les abus des entreprises. Les banques de développement peuvent jouer un rôle positif dans le soutien des entreprises et des droits humains – demandant à leur client de s’occuper des risques qui existent en matière de droits humains, ou d’aider à renforcer les différents moyen de protection des droits humains à un niveau national, telles que les lois autour du déplacement ou l’accès à l’information. Elles peuvent aussi jouer un rôle négatif – en finançant des industries polluantes ou en faisant la promotion de la privatisation de services publics. Afin d’étudier l’impact du financement du développement sur les entreprises et les droits humains en Afrique, la Coalition pour les droits humains dans le développement s’est associée à la Coalition Africaine pour la Redevabilité des Entreprises et le Centre for Human Rights à l’Université de Pretoria, en Afrique du Sud, pour plusieurs journées très énergiques sur le renforcement des capacités et l’élaboration de stratégies. Au cours de l’Assemblée Générale de l’ACCA, qui a rassemblé environ 100 organisations membres de l’ACCA et des partenaires venant de tout le continent, la Coalition a organisé une table ronde intitulée “La redevabilité dans le contexte du financement du développement”. 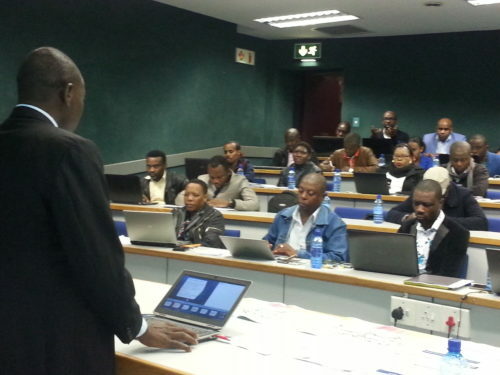 Lors de la session, Nomonde Nyembe du Centre for Applied Legal Studies en Afrique du Sud a étudié avec les membres de l’ACCA les liens entre les financements du développement et les activités des entreprises, et a décrit les différents rôles que le financement peut jouer dans une transaction d’entreprise, particulièrement lorsque les acteurs du développement se fient davantage au secteur privé. 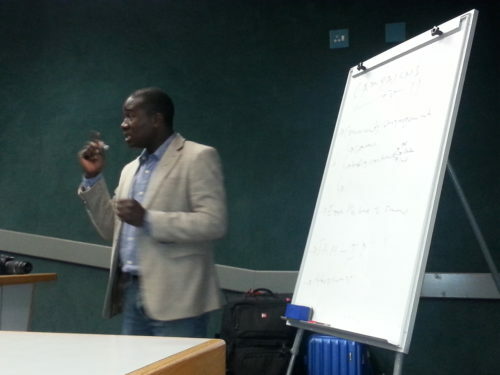 Reinford Mwangonde de Citizens for Justice au Malawi et Delphine Djiraïbé du Public Interest Law Center au Tchad ont partagé deux études de cas dans lesquels les banques de développement avaient l’habitude de tenir les entreprises et les gouvernements responsables des impacts qu’ils avaient sur les droits humains. Djirabe a partagé la façon dont PILC a utilisé la Banque mondiale pour faire pression sur Exxon Mobile et sur le gouvernement du Tchad afin de défier les violations en matière de droits humains et les abus environnementaux découlant de la construction de l’oléoduc entre le Tchad et le Cameroun. Reinford Mwangonde a partagé l’expérience de Citizens for Justice qui a eu recours à ses relations dans le domaine du financement du développement afin d’éviter le projet de la compagnie des eaux du Malawi d’installer des compteurs d’eau et de menacer ainsi l’accès public à l’eau. Paul Guy Hyomeni du Réseau Camerounais des Organisations des Droits de l’homme (RECODH) au Cameroun et la coordinatrice de la Coalition Gretchen Gordon ont souligné les possibilités d’un possible engagement de l’ACCA à l’avenir, mais ont aussi insisté sur les réunions bi-annuelles des gouverneurs africains de la Banque mondiale et du FMI, une politique de développement à la nouvelle banque de développement des BRICS qui ouvrira bientôt un bureau régional à Johannesburg, une consultation régionale de la Banque de développement africaine, ainsi que le contrôle et le plaidoyer autour des centaines de projets de développement ayant des impacts sur les communautés d’Afrique. La même semaine, la Coalition a facilité une demi-journée de “formation sur le financement du développement et la redevabilité des entreprises” dans le cadre d’un Cours succinct sur les entreprises et les droits humains organisé par le Centre for Human Rights de l’Université de Pretoria pour environ 50 élèves de master en droit, de membres de l’ACCA, et d’employés de plusieurs institutions nationales africaines des droits humains. Hyomeni a présenté une étude de cas du projet de barrage de Lom Pangar au Cameroun afin de décrire l’ensemble des incidences sur les droits humains qu’impliquent les activités de développement. Ce projet, financé par la Banque de développement africaine, la Banque mondiale, et la Banque européenne d’investissement, affecte 17 communautés différentes et implique la relocalisation de plus de 500 foyers. Ces familles, qui se consacrent principalement à l’agriculture et à l’exploitation minière artisanale, ont été expulsées de leurs terres et éloignées de leur moyen de subsistance sans consultation véritable ou sans indemnisation juste. RECODH espère pouvoir faire pression sur les banques de développement pour assurer la protection des communautés avant que la construction ne débute pour l’étape suivante du projet. Mwangonde et Gordon ont utilisé l’exemple du projet d’adduction d’eau de Lilongwe au Malawi, financé par la Banque africaine de développement, la Banque mondiale et la Banque européenne d’investissement, afin de décrire les différentes mesures qui peuvent être prises pour avoir un impact sur les activités de développement. Dans ce projet d’adduction d’eau, Citizens for Justice a engagé le dialogue avec les communautés locales affectées par le projet, a collecté des données sur les préoccupations des communautés et sur les impacts environnementaux, a entrepris des activités de plaidoyer avec des représentants de la Banque mondiale et des représentants du gouvernement alliés, et a exploré les possibilités de recours judiciaire et non-judiciaire. Wilmien Wicomb du Legal Resources Centre en Afrique du Sud et Nyembe ont utilisé l’étude de cas du projet Trident – la plus grande mine de cuivre de Zambie – afin de décrire les enjeux et les opportunités pour garantir la transparence dans les activités de développement. Alors que les normes environnementales et sociales de rendement de la société financière internationale -qui était un investisseur de la mine- auraient dû être appliquées, Wicomb a expliqué que les règles de l’IFC, de la catégorisation des risques à l’évaluation de l’impact et à la compensation de réinstallation, ont été ignorées. La compagnie minière a fait pression sur les autorités traditionnelles afin qu’elles cèdent une immense étendue de terre appartenant à la communauté sans consulter la communauté elle-même. L’IFC a ensuite désinvesti sa participation dans l’entreprise, compliquant alors toutes possibilités de recours. Au cours de la semaine pendant laquelle les évènements ont eu lieu, l’enjeu du financement du développement a été un thème récurrent. Les membres de la Coalition et de l’ACCA ont saisi l’opportunité pour publier une déclaration à la Banque mondiale signée par trente-quatre groupes de la société civile africaine appelant l’institution à renforcer sa sauvegarde afin d’assurer la protection des droits humains. L’ACCA étudie également les possibilités d’incorporer un engagement dans le domaine du financement du développement dans le cadre de son travail autour de l’accès aux recours. Alors que les experts financiers du développement et les entreprises se tournent vers l’Afrique pour des possibilités d’investissement, la société civile africaine oeuvre à l’identification d’opportunités et de stratégies pour garantir que le développement soutienne la mise en oeuvre des droits humains pour tous, et qu’il ne soit pas seulement profitable à quelques-uns. Pour plus d’informations, veuillez consulter le guide d’information de la Coalition sur le Financement du développement en afrique. 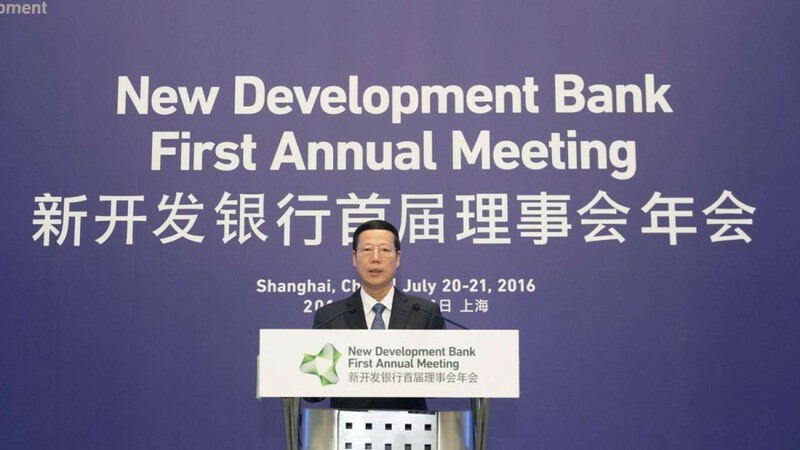 Last July 20-21, the city of Shanghai (China) hosted the First Annual Meeting of the New Development Bank (NDB), the multilateral financial institution established in 2015 by the BRICS countries (Brazil, Russia, India, China and South Africa). 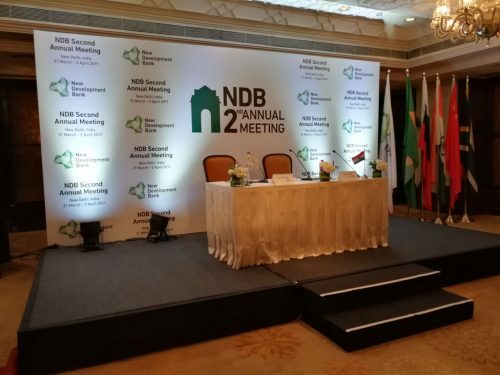 The event, which marked completion of the Bank’s first year, included meetings of the NDB’s Board of Governors and Board of Directors, as well as a “High Level Seminar” open to the public. Although the first year of operations of the Bank has shown some positive aspects that reflect its potential to become something « new » in development financing, there are still significant concerns regarding transparency, engagement with civil society and the social and environmental safeguards applied to projects; and many questions remain on how the Bank will operate. What type of investments will NDB support? During the annual meeting, the Bank approved a $100 million loan to the Eurasian Development Bank (EDB) and the International Investment Bank (IIB) for a small-scale energy project involving the construction of two hydropower plants with a combined capacity of about 50 megawatts in the region of Karelia, Russia. Together with loans approved in April, the Bank has now confirmed its first tranche of projects, one in each of its five member countries, totaling an amount of $911 million. The projects include the following: a $250 million loan to India’s Canara Bank for 500 megawatts of renewable-energy projects in India; an $81 million loan for 100 megawatts of rooftop solar power in China; a $300 million loan to Brazil´s national development bank, BNDES, to develop 600 megawatts of renewable energy capacity in Brazil; and a $180 million loan to South Africa’s public electricity company, Eskom, for investment in transmission lines and the connection of renewable electricity capacity to the national grid. According to the Bank, its projects involve “green and sustainable infrastructure”, but is not clear yet how the Bank defines those concepts and what environmental or social criteria the bank took into consideration during project selection or appraisal. Bank staff have provided contradictory information on whether a social and environmental policy framework has been finalized. No such policy has been made public. Bank officials have stated a preference for reliance on the domestic legal and regulatory systems of NDB member countries and a confidence that these standards are well developed. This is worrying, given that in many areas BRICS country systems – either in law or in practice – don’t provide adequate protection for people and the environment. The NDB did announce the approval of an Interim Information Disclosure Policy. Such an instrument will be essential not only to have access to the operational policies of the Bank, but also to ensure that communities and the public at large have access to information on NDB-financed projects. Unfortunately, it is not yet possible to know whether the Bank´s Disclosure Policy will be adequate for this purpose, as it has not yet been disclosed. Where will the Bank lend? 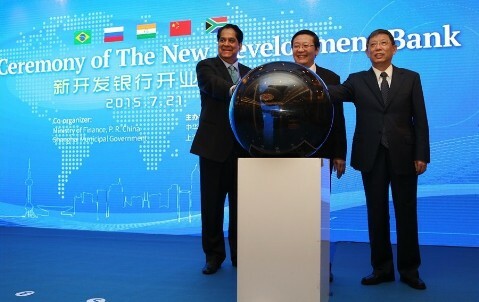 Till now, the NDB has only financed projects within the five BRICS countries. In the meeting in Shanghai, however, officials identified that the Bank will move forward with bringing in new members. According to the NDB’s Brazilian vice president, Paulo Nogueira Batista, now that the Bank is established, it should broaden its membership in order to attract the highest possible credit rating and strengthen its legitimacy. Thus, new members are expected to join by 2018, with the Bank targeting big emerging economies such as Mexico or Indonesia. According to Leslie Maasdorp, NDB´s South African vice president, the Bank may lend for projects outside its member countries, as long as the projects in some way benefit the member countries. This lending criterion is quite unclear. It also calls into question the Bank’s argument that it does not need a strong environmental and social safeguards policy since it can rely on what it asserts are strong legal and regulatory systems within BRICS nations. To whom will the Bank lend? Thus far NDB has focused on sovereign-backed loans within the BRICS countries, so in other words, loans to national development banks or other public banks. In Shanghai, however, NDB Directors Luis Antonio Balduino Carneiro, Brazil’s Secretary for International Affairs, and Sergei Storchak, Russia’s Deputy Minister of Finance, highlighted the importance of leveraging private sector financing through direct lending to the private sector as well as public-private partnerships. This again raises the question of what rules will apply to this new private sector lending. Despite the Bank´s stated intention of becoming a green institution with a new development model, a criticism raised by many groups is the lack of proper and institutional engagement with civil society. For instance, many groups pointed to the lack of accessibility of the Annual Meeting, citing a registration window of under a week, lack of notice, and denials of registration for some participants. Civil society participation was limited to two panel discussions during the High Level Seminar, only one of which was on the NDB. There were no civil society speakers in the event. More importantly, as groups have continually raised, the Bank suffers from critical lack of transparency and has no provisions for meaningful engagement with civil society. While it appears that social and environmental policies have been established, there has been no consultation with civil society on these policies. The reason given by bank officials in Shanghai for the lack of engagement with civil society is that the Bank is new and it has a small structure, with staffing constraints. However, this alleged lack of institutional capacity is not a valid justification for the lack of engagement with civil society, especially if the Bank is already financing projects and looking forward to expanding its membership and engagement with other stakeholders, such as the private sector. If the Bank is truly looking for a new development model, it should promote an effective and proper engagement with civil society. Meaningful participation and listening to stakeholders, especially to communities affected by NDB projects, is a prerequisite for effective development. 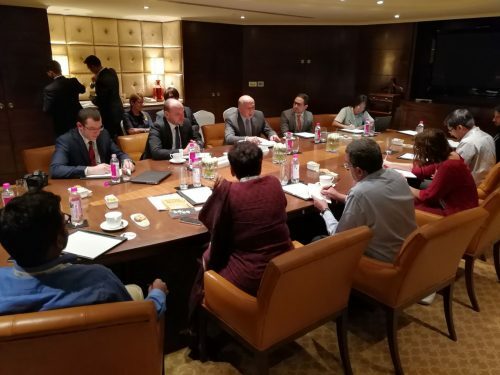 Civil society groups from BRICS countries are presently preparing to bring these and other concerns to the next Civil BRICS Forum to be held October 3-4 in New Delhi, India. The organizers of the Civil BRICS Forum, which will gather civil society organizations from BRICS countries, are hoping to make an impact on the official 8th BRICS Summit, which will bring together heads of State from the BRICS countries October 15-16 in the city of Goa, India. Civil society groups may also organize a more grassroots Peoples Summit in conjunction with the official summit. 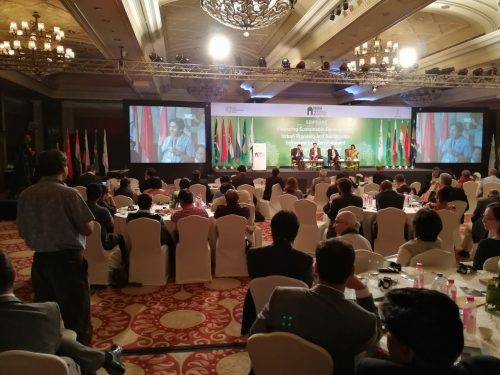 The events surrounding the BRICS Summit represent a good opportunity not only for CSOs and other interested stakeholders to influence NDB and BRICS agendas; but also for the Bank to promote a more transparent and institutionalized engagement with civil society and start addressing the many concerns that the NDB’s first year of operations has raised. Gonzalo Roza coordinates the Global Governance Area of Fundeps (Foundation for the Development of Sustainable Policies – Argentina) and the NDB Working Group of the Coalition for Human Rights in Development, a global coalition of social movements, civil society organizations, and grassroots groups working to ensure that all development finance institutions respect human rights. 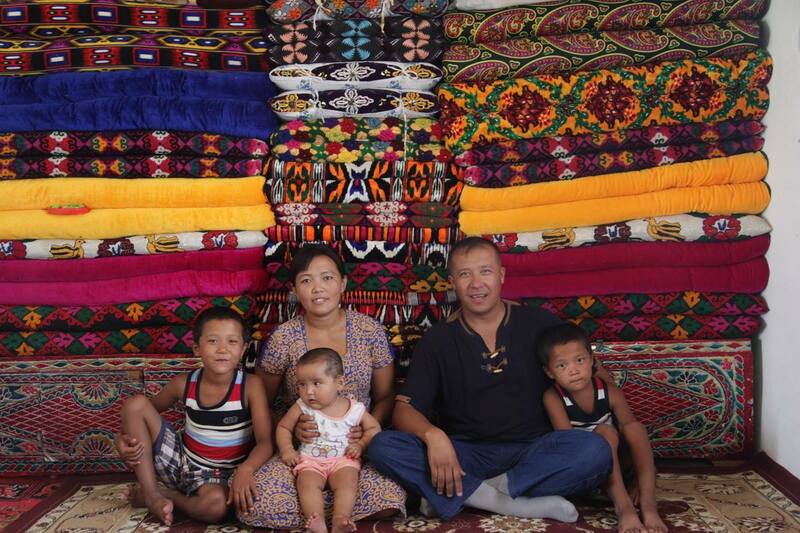 *Editor’s note: On July 30, 2016, a victim of forced labor in cotton production and three Uzbek human rights defenders filed a complaint on June 30, 2016, against the World Bank’s private sector lending arm. The complaint against the International Finance Corporation (IFC) was filed with the Compliance Advisor Ombudsman, an independent accountability unit for the IFC. It seeks an investigation into forced labor connected to a $40 million loan to Indorama Kokand Textile, which operates in Uzbekistan. The forced labor victim, who requested confidentiality, and the rights defenders Dmitry Tikhonov, Elena Urlaeva, and a third who requested confidentiality, presented evidence that the loan to expand the company’s manufacturing of cotton goods in Uzbekistan allows it to profit from forced labor and to sell illicit goods. The complainants additionally detailed a disturbing pattern of harassment and attacks on labor monitors and human rights defenders. See the press release from the Cotton Campaign coalition, the Uzbek-German Forum for Human Rights, International Labor Rights Forum, and Human Rights Watch. The government has responded with particular vehemence to attempts by activists to monitor labor and human rights issues related to cotton work. In 2015 this harassment reached unprecedented levels as the government used arbitrary detention, threats, degrading ill-treatment, and other repressive means to silence monitors and undermine their ability to conduct research and provide information to the ILO and other international institutions. This interference undermines the government’s stated commitments to take steps to reform its cotton sector and calls into serious question the government’s role as a good faith partner in reform. Interference with the work of independent monitors should raise deep concerns on the part of the World Bank, ILO, and other international partners. Independent monitors who met with the World Bank and the ILO told us that these institutions did not appear to prioritize the safety of independent monitors, rarely making inquiries and not making public statements or offering other support when monitors were arrested, ill-treated, or experienced other trouble. In 2015 the government imposed spurious criminal sanctions on one Uzbek-German Forum monitor that prevent him from future human rights monitoring work and forced another to flee the country. The government’s persecution of independent monitors is deeply troubling both for the individual harms suffered and also because it threatens the ability to carry out independent monitoring of cotton harvest labor practices at all. 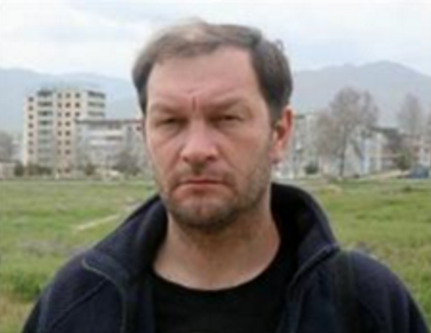 Dmitry Tikhonov, a journalist, civic activist, and human rights defender, has worked for four years with the Uzbek-German Forum to document labor and other human rights issues connected to cotton production in Uzbekistan. Tikhonov, who was based in Angren, and had a home office in nearby Yangiabad, conducted this work openly and, over the last several years has regularly provided information to the ILO, World Bank, and international organizations working in Uzbekistan. In August 2015, Tikhonov learned that the police had begun questioning his friends and acquaintances to gather information about him and his work. Several days later, Tikhonov was briefly detained after a spurious traffic stop. A police officer temporarily confiscated his research materials including mobile phone, smartphone, and flash drives, and Tikhonov credibly believes police copied the materials. On September 30, Tikhonov arranged for an ILO monitoring team to meet with people from Angren who were forcibly mobilized to pick cotton. On the way to the meeting he noticed he was followed by plainclothes men in three cars. He later learned that police visited the workplaces of all the people who spoke to ILO monitors and interrogated them. Tikhonov learned that police charged him with hooliganism, a misdemeanor that carries a penalty of up to 15 days’ administrative detention, stemming from the complaint made by the three mahalla chairpersons. Tikhonov remained away from home for several weeks until October 27, when he learned that there had been a major fire at his home in Yangiabad October 20. The police knew about the fire when it occurred, but failed to inform Tikhonov’s lawyer, who maintained regular contact with them. 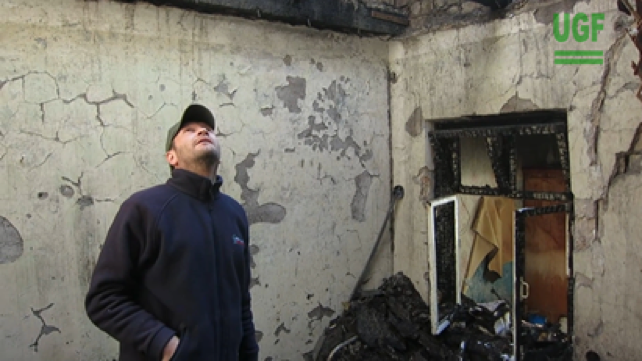 Tikhonov found that only the room he had used as his home office had burned but the entire room and its contents were completely destroyed—even the roof had collapsed. He lost everything he used for his work, including two computers, a laptop, a printer/scanner, video and sound equipment, all his contacts, papers and files as well as his legal library. Tikhonov’s cash savings in the amount of $1500 was also burned and most of his clothing was destroyed. Tikhonov also noted that a box containing about 100 legal guides on child and forced labor that he had created for distribution had disappeared even though it was kept in another room that did not burn. In addition, Tikhonov said that his two hard drives went missing after the fire. One contained his archive and database, and the other had his current work. The hard drives were stored in a metal box that Tikhonov dug out of the burned debris. The box was there but the hard drives were missing and no parts of them were visible. Around the same time, police brought two more administrative cases of hooliganism against Tikonov, one stemming from video recordings the officials could only have accessed from his equipment or email, since he had the only copy and the video was never made public, alleging that he made the recordings without permission. The other charges allege that on October 27, the day Tikhonov went to assess the damage at his home, he caused a scandal with some people in Angren, 13 kilometers away. Tikhonov does not know the other people allegedly involved. Committing a third administrative offense in the course of a year can result in criminal, rather than misdemeanor charges, and Tikhonov feared that he could go to prison. Eventually he was convicted and fined on the third set of charges. In addition, a series of articles appeared on pre-government websites discrediting Tikhonov, accusing him of corruption and of being an American agent. Some of the articles “analyzed” Tikhonov’s unpublished research findings that could only have been taken from his computer and email. Fearing possible spurious criminal prosecution and other forms of persecution, Tikhonov was forced to flee Uzbekistan and is now residing outside the country, unable to continue his monitoring. d labor in the cotton sector. On November 16, 2015 police arrested Pardaev on spurious charges of taking a bribe, insult, and fraud on the basis of a complaint allegedly made by someone who had previously sought Pardaev’s assistance with whom Pardaev had never exchanged any money. In the weeks prior to his arrest, Pardaev noticed increased surveillance of his activities. The National Security Service, known widely by its Russian acronym, the SNB, summoned several of Pardaev’s acquaintances and people he had assisted and interrogated them, beating some of them. He told staff at several international embassies that he feared arrest. Pardaev was held for 57 days in a pretrial detention center in the Dustlik district of Jizzakh and on December 26 was transferred to pretrial detention in Khavast, in the Syrdaryo region. Guards there beat him severely in one occasion, apparently for failing to get undressed quickly. Pardaev went to trial on January 11, 2016. After a single hearing, a judge of the Dustlik district court convicted Pardaev of all charges and sentenced him to 5 and a half years in prison. The judge suspended the sentence, imposing three years’ probation, and Pardaev risks prison if found to violate any conditions of his probation, which include a 10 p.m. curfew, registering twice monthly at the police station, and not traveling outside the Jizzakh region. Police have also told him that he is forbidden from all human rights work, although this prohibition is not included in the sentencing documents. 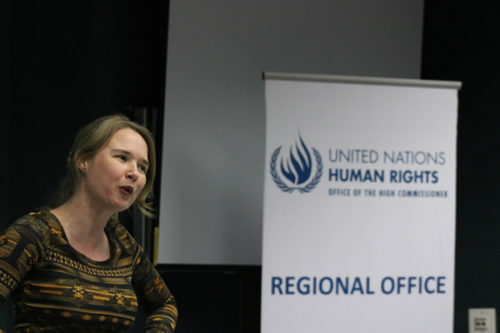 A long-time human rights and civic activist, Elena Urlaeva, head of the Tashkent-based Human Rights Alliance of Uzbekistan, has monitored labor rights and the cotton harvest for many years and met regularly with the ILO during the 2015 season. She was arrested on at least four occasions during the 2015 cotton harvest as well as twice during the spring planting and weeding season. 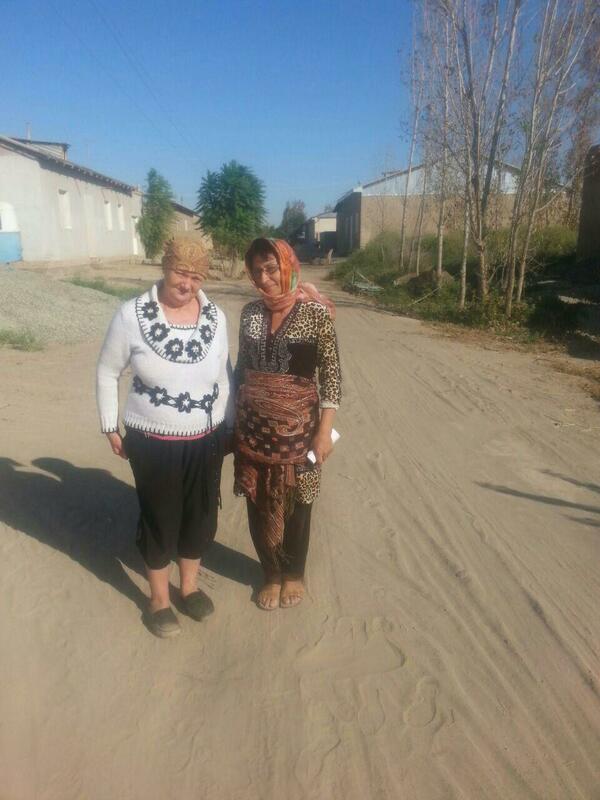 On one occasion, on September 19, police in Kuychirchik, in the Tashkent region, arrested Urlaeva, her husband, their 11-year-old son, a family friend and a farmer who had invited them to stay on his land. Police arrested them ostensibly because Urlaeva “photographed the fields without permission,” when she was walking with the farmer. Urlaeva and her family were released late that evening after lengthy interrogations, but police held the farmer in custody overnight. Police also arrested Urlaeva twice in May when she distributed information about the prohibition against forced labor when local officials were sending people to weed the cotton fields. 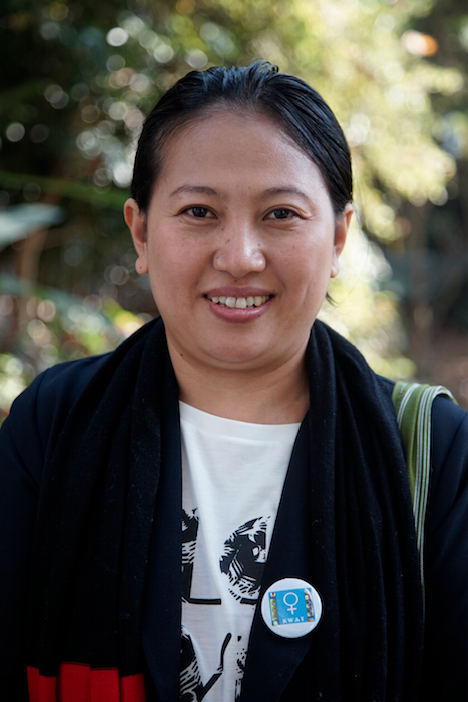 Police in Chinaz arrested Urlaeva on May 31, 2015, as she observed the forced mobilization of medical workers to the fields. They held her for 11 hours and subjected her to severe ill-treatment, including forcibly injecting her with sedatives, subjecting her to a forced x-ray, and carrying out a body cavity search to look for a flash drive. Police refused her access to a toilet, making her relieve herself outside in front of police officers, who filmed her and humiliated her. They later posted a video of the incident on the internet. Urlaeva also observed near constant surveillance from August through November, including plainclothes men posted outside her home, following her, and taking video recordings and photographs of her. She described this as psychologically exhausting as well as a serious impediment to her work. On March 9, 2016, Urlaeva checked into the Tashkent City Psychiatric Clinic after experiencing multiple traumatic events, including ill-treatment by the police during her efforts to monitor the cotton harvest. In late April, Urlaeva’s doctor informed her and her son that she was in good health and would be released on May 2. However, the hospital then refused to release Urlaeva without citing any medical reason, citing “official orders,” in effect using the hospital as a means of punitive, arbitrary detention. The hospital finally released Urlaeva on June 1, after significant international pressure. Malohat Eshankulova is a Tashkent-based independent journalist and activist who has monitored and written about labor rights in the cotton industry for several years, including with the Uzbek-German Forum. On September 27, police in the Saikhunbad district of the Khorezm region arrested Eshankulova along with Elena Urlaeva and held them at the police station for several hours. On September 29, Eshankulova, Urlaeva, and two local activists who together were observing college students being sent to the harvest in the Khazarasp district of Khorezm. Police arbitrarily detained them for 14 hours, during which they were interrogated constantly about their activities and accused by the police of “treason to the motherland.” Police also subjected Eshankulova and Urlaeva to a strip search and body cavity search. Police released them without charge after threatening to kill them if they ever returned to Khorezm. Security services officers in the Ellikkalа and Beruni districts of Karakalpakstan, sites of World Bank-funded projects, prevented Eshankulova and Urlaeva from meeting with teachers and medical workers forcibly sent to the cotton fields in October. The information in this section comes from letters, emails, and telephone interviews with Dmitry Tikhonov from September 2015-February 2016. Minor hooliganism is art. 183 of the administrative code. Information in this section comes from telephone conversations and email correspondence between Elena Urlaeva and the Uzbek-German Forum for Human Rights. Information in this section comes from telephone conversations and email correspondence between Malohat Eshankulova and the Uzbek-German Forum for Human Rights. The Phenix Center is an independent think tank in Amman, Jordan that promotes workers rights and carries out policy analysis in order to build a sustainable development model based on principles of democracy and human rights. Our organization and other civil society organizations play a crucial role in promoting freedoms, rights and democracy in Jordan’s development. Today, international financial institutions are beginning to fund more renewable energy, agriculture, and other development projects in my country. The European Bank for Reconstruction and Development in particular is looking to increase their investments here and in the countries in the region viewed as more stable and favourable for investment. 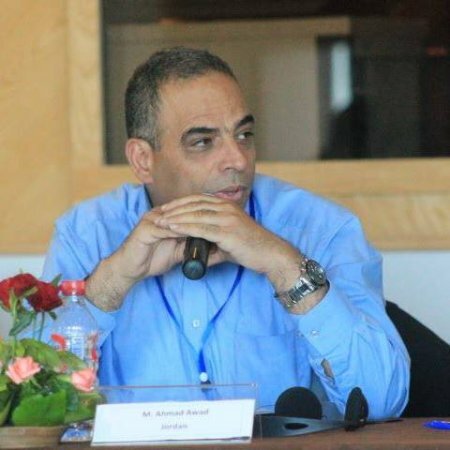 However, after a period of increasing public freedoms on the wave of the Arab spring and some progress toward democracy, Jordan has taken several steps backwards in recent years in terms of freedom of expression and association and the space for civil society organizations. Successive governments have started to limit public freedoms under the banner of security and fighting terrorism. There is a double discourse wherein the government emphasizes in its statements that confronting extremism and terrorism implies the promotion of human rights of all citizens. In practice, however, several policies and drafted several laws, imposing restrictions on freedoms of opinion, expression, and assembly. As soon as I started advocating for the rights of trade unions, I received several threats from the official authorities, who said that my work was jeopardizing the possibilities of receiving foreign investments. We started receiving calls from government authorities, trying to intervene in our activities. Training workshops we organized were canceled by the official authorities, on the grounds that the support we are giving to new and independent trade unions is “putting the stability of Jordan at risk”. Official authorities asked me more than once to stop working on freedom of association. Moreover, many unionists have received calls from official authorities asking them not to collaborate with our organization. Companies whose employees we have supported in strikes have presented accusations against us to the government. The government recently introduced several draft laws that criminalize workers’ right to strike and prevent civil society organizations from participating in the social and political life of the country, by limiting their space of action. Many civil society groups have reported being forced to stop working on projects after the official authorities contacted them. There are several development projects in planning by the European Bank for Reconstruction and Development and other banks, such as the Red Sea – Dead Sea corridor. There the workers are mostly migrants and don’t have the ability to express themselves. They don’t have rights, are foreigners here, and they are very afraid. We tried to get them to organize to defend their rights, but we failed. We have met with the European Bank for Reconstruction and Development, the World Bank and other international financial institutions to urge them to take seriously the situation of civil society in Jordan and the region, and to promote an enabling environment for participation and freedoms of assembly and association. We have had consultations and discussions on various issues. But the development banks still struggle when it comes to actually implementing their own safeguards or ensuring basic transparency and access to information. What we try to do is use the Banks’ information, plus make contact with local groups impacted by development projects to find out how we can support them to improve working conditions and prevent environmental contamination. But in some cases, the government and management of the projects have refused all suggestions regarding implementation of safeguard policies or refused to respond to complaints about contamination. The EBRD’s IPP4 Al-Manakher Power Project, for instance, is considered a “strategic” project for Jordan, so the government doesn’t want anyone to challenge it. I can say I am pretty able to express myself freely; but of course I know I have to consider the possibility of receiving threats or being put under pressure. I do not see the situation improving in the short-term, but we will continue our organizing campaigns, speeches and activities to advocate for human rights and in particular freedom of expression in Jordan, and we will keep on developing and building a network of cooperation and relationships with other civil society organizations and associations in order to prevent any potential violations that may occur. 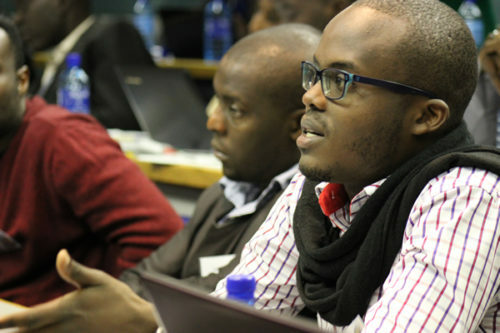 Omot was arrested on March 15 with six others while en route to the workshop in Nairobi, Kenya. Three were released without charge on April 24, 2015 and a fourth on June 26, 2015. The authorities charged the two others, Ashinie Astin and Jamal Oumar Hojele, also under the counterterrorism law. The World Bank’s Protection of Basic Services (PBS) program funded block grants to regional governments, including paying salaries of government officials. The former residents alleged that the program was harming them by contributing to the government’s abusive “villagization” program. The program forcibly evicted indigenous and other marginalized peoples from their traditional lands and relocated them to new villages. In its report to the World Bank board of directors, which was leaked to the media in December 2014, the Inspection Panel concluded that the Bank had violated some of its own policies in Ethiopia. Several days after Omot’s arrest, a witness saw four armed federal police officers and four plainclothes security officials take Omot, in chains, to his house in Addis Ababa where they removed computers, cameras, and other documents. The seizure of Omot’s computers and other materials raises concerns about the security of other Gambella community members the Inspection Panel interviewed. Given the severe restrictions on human rights investigation and reporting in Ethiopia, it is virtually impossible for rights groups to learn about reprisals in the villages the Inspection Panel visited. The GPLM is not among the five organizations that the Ethiopian parliament has designated terrorist groups. GPLM is an ethnic Anuak organization that fought alongside the Tigrayan People’s Liberation Front (TPLF) to oust the repressive Derg regime in the 1990s. In 1998, GPLM was folded into the Ethiopian People’s Revolutionary Democratic Front (EPRDF) power structure. Currently the GPLM has no public profile, no known leadership structure, and has not made any public statement of its goals. All three detainees were moved to Kalinto prison, on the outskirts of the capital, Addis Ababa, after spending more than five months in Maekelawi, the Federal Police Crime Investigation Sector in the city. Human Rights Watch and other organizations have documented torture and other ill-treatment at Maekelawi. Omot, and possibly the other two detainees, were held in solitary confinement for three weeks upon their arrest, and all have had limited access to family members. Jamal and Omot have reportedly been in poor health. The detainees were held 161 days without charge, well beyond the four months allowed under Ethiopia’s Anti-Terrorism Proclamation, and a period in violation of international human rights standards and among the longest permitted by law in the world. The next hearing in the case is scheduled for August 4, 2016. Ethiopian authorities should immediately drop all charges and release Omot and the two other local activists charged with him under Ethiopia’s repressive counterterrorism law. The World Bank should vigorously respond to this reprisal against Omot Agwa, by – at a minimum – publicly denouncing his arrest and pushing the government to drop the charges and release him. The Ugandan government has increasingly intimidated activists working on sensitive subjects and has obstructed civil society reporting and advocacy in recent years. Amongst those targeted by the government have been community members and independent groups who have been critical of proposed development initiatives, including initiatives funded by the International Finance Corporation, the World Bank’s private sector arm. According to NGO and media reports, between 2006 and 2010 security forces forcibly and brutally removed several thousand people from Mubende and Kiboga districts in Uganda to make way for the IFC-financed New Forests Company to operate pine and eucalyptus plantations over several years. In doing so, the government ignored interim High Court orders barring the evictions pending a full hearing, among other violations of the rights of the community. 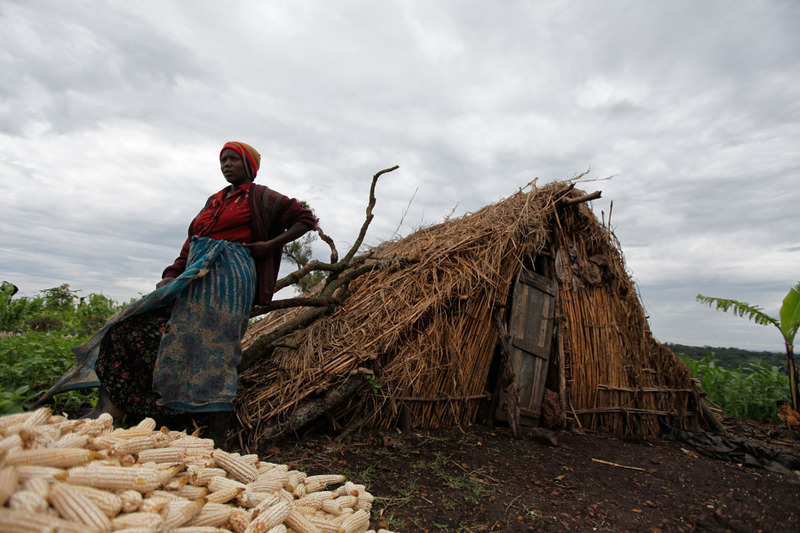 The government labeled the residents “illegal encroachers.” In September 2011, Oxfam published a report on land conflicts in various countries around the world, which included a case study researched and written by Uganda Land Alliance (ULA) together with Oxfam documenting the forced evictions. New Forests Company has strongly denied any involvement in evictions or violence and challenged the NGO findings. In December 2011, several community representatives, ULA, and Oxfam filed a complaint on behalf of the affected communities with the IFC’s independent accountability mechanism, the Compliance Advisor Ombudsman (CAO). This led to a mediation process resulting in settlements between the communities and New Forests Company in July 2013 and May 2014. The Ministry of Internal Affairs tasked the government’s NGO Board to conduct a wide-ranging investigation which went well beyond the legal mandate and technical capacity of the board. Ultimately, the NGO Board investigation recommended that the NGOs have their permits withdrawn if they did not take “corrective action,” that the Oxfam report be “withdrawn,” and that a retraction be issued. Furthermore, the board said that the NGOs should “make apologies” to the Ugandan government and to the president. In a May 2012 letter to ULA, the minister of internal affairs called the group “contemptuous,” and accused it of seeking to “ridicule” the government’s authority and institutions. The minister reportedly told ULA and Oxfam that they would lose their licenses to operate, and therefore have to close down if they did not retract their report findings and apologize. In his opening remarks at the National Civil Society Fair, the minister further accused ULA of “peddling lies” and said that he would “bring them to order so that they don’t spoil the image of the country, the head of state, and the first family, and any other institutions of government.” On June 14, 2012, ULA publicly expressed regret for inaccurate or speculative statements that the media might have made when writing on the content of the report and apologized for misunderstandings. According to current and former employees at ULA, the organization and some staff members faced threats and surveillance after ULA published the report on the evictions in Mubende and Kiboga and later filed a complaint with the CAO. Unidentified men began telephoning both the executive director and the communications officer, telling them to “back off” this issue. Anonymous callers threatened two activists on various occasions. Community members also reported to ULA that they had faced threats and harassment for articulating concerns about the project, and said they had been under surveillance. Free speech is the cornerstone of transparency and accountability. Where World Bank projects are being implemented, citizens must have a voice.… The World Bank should have done more to protect the security of people speaking out against this project. It’s us who facilitate the voice of the people. I’m not aware of them [the World Bank] doing anything [about the reprisals against critics of this project].… This makes me believe they think free speech is not an issue for them. There is still the stigma. We don’t go out as strong any more. We are very cautious about what we say. We don’t say anything controversial in a meeting any more. It affects how we do our things. When ULA makes a statement critical of government action, some staff members feel that the government’s response continues to be that ULA is motivated by a desire to undermine government programs. On May 17, 2014, the ULA office in Kampala was burgled and information-rich property, such as computers and cameras, were stolen, while other more valuable property was left untouched. It is unclear if this event was connected to the evictions reporting, but some observers felt it may have been. ULA reported the burglary to the police, but it remains unsolved. Throughout this period, the CAO’s progress reports were silent about the government’s attacks on Oxfam and ULA. According to the World Bank’s country manager at the time, ULA did inform the World Bank country office about the government’s threats of deregistration. In addition, the government’s hostile verbal attacks on ULA, including threats of deregistration and demands for apologies, were well reported in the Ugandan media. But to the best of the knowledge of former and current ULA employees interviewed, the World Bank and IFC did not emphasize to the government the important and legitimate role ULA, Oxfam, and other independent groups play in scrutinizing development projects or urge the government to cease their public attacks and efforts to close their offices. The former World Bank country manager conceded to Human Rights Watch that they had not taken concrete steps to help create or protect any kind of a space within which community members, NGOs, and journalists could publicly raise concerns about this or other projects. Rather, the Bank viewed free speech issues and the broader crackdowns on civil society as being best handled by bilateral donors. The World Bank representative also said that while ULA had reported the attacks to the World Bank, they had not expressly asked that the Bank do anything about the attacks they were facing. Published in Human Rights Watch report, At Your Own Risk, June 2015. My name is Abhijeet*. I am a community member in Sindhuli, Nepal and I am actively resisting against human and environmental rights violations in the construction of the Khimti-Dhalkebar Transmission Line (KDTL Project). The KDTL Project is a high-voltage transmission line that will cross the area of Sindhuli. It is being funded by the World Bank and implemented by the Nepal Electricity Authority (NEA). 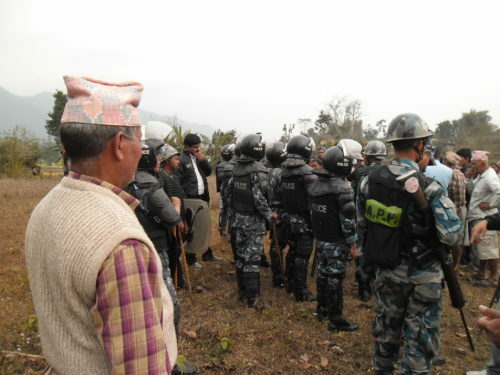 The KDTL Project is violating the fundamental human rights of indigenous and local peoples of Sindhuli. We are directly and indirectly affected by the transmission line and are very concerned about its impacts, especially health impacts. However, the project developers have not provided adequate information to us or consulted with us. Even after people went to the project office, requesting information, they still did not provide the requested information. They didn’t post information or notices in the project construction area either. Nor did they provide information through print media or radio media. In April 2016, when communities affected by the KDTL Project engaged in a peaceful protest on their own lands, the police responded with violence, injuring several people. On the same day, the police also arrested community leaders. The leaders were only released the next day after they signed a document in which they agreed to no longer obstruct project construction. Right now, in Nepal, the political situation is very bad. The new constitution is highly discriminatory and excludes the rights of Indigenous peoples, Madhesi people, Dalit people and women as well. In fact, the government has killed more than 40 peoples in clashes related to the new constitution. Currently, there is much conflict between civil society and the government. One of the key issues is that the government is not implementing its existing laws that protect and promote the human rights of Nepalese Indigenous peoples. The general perception is that the government is narrowing the space for civil society organizations, which is having a chilling effect. 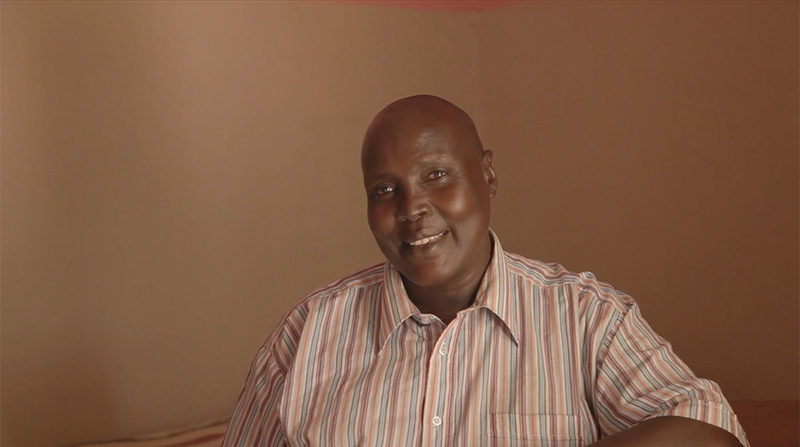 I have provided technical support, such as writing letters and demanding information from authorities, to protect and promote the rights of fellow local communities affected by the KDTV Project. Because of my efforts, I have been threatened by security and project officials. They tried to intimidate me into stopping my acts of resistance. I am not able to participate and freely express my thoughts about development projects. Development projects are a key priority for the central government of Nepal, which has been repressive towards the issues of local and Indigenous voices while pushing forward its development agenda. I have worked hard with other project affected peoples and allies including the Lawyers’ Association for Human Rights of Nepalese Indigenous Peoples to challenge these limitations. Now, the KDTL Project issue has become internationalized, and we are getting support and engagement from international human rights organizations. 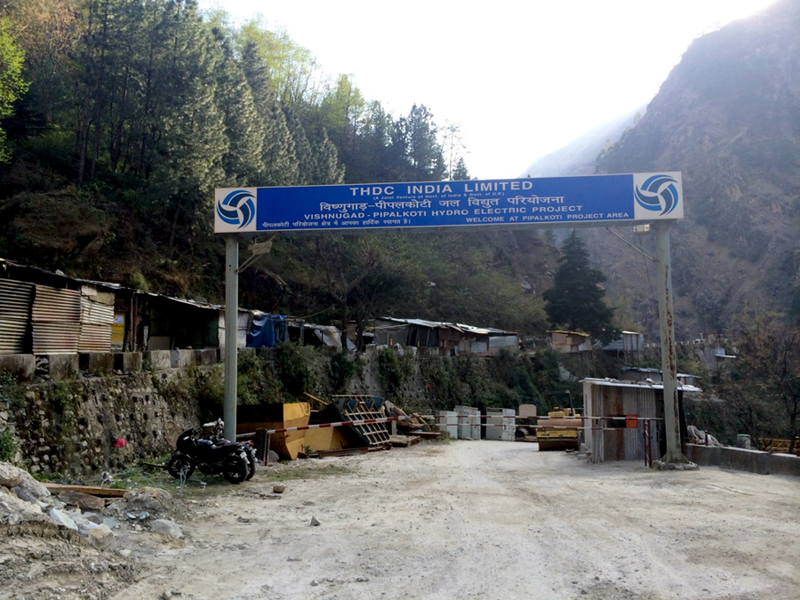 We have filed complaints in the Nepalese Supreme Court, the National Human Rights Commission (Nepal) and the Inspection Panel of the World Bank. 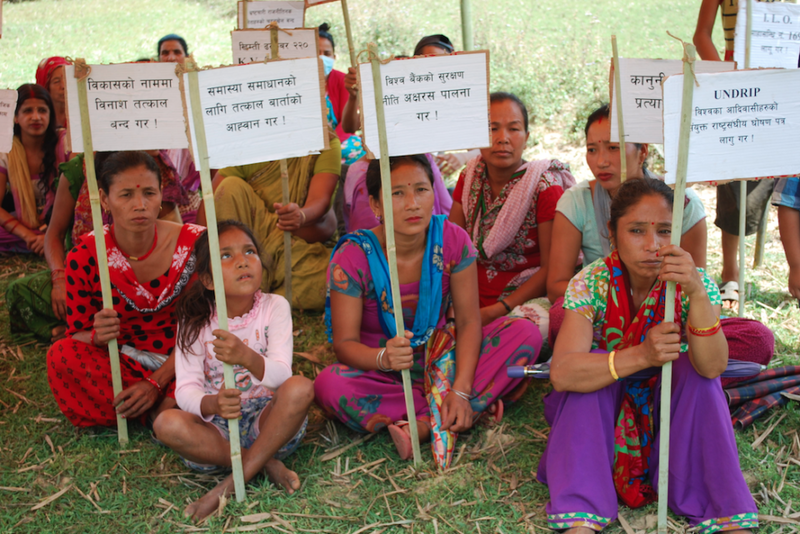 As a result of the sustained resistance of the local struggle committee in Sindhuli, project affected peoples have been offered more compensation, although the amounts are still highly inadequate. Unfortunately, the NEA and the World Bank have still not provided proper information or consultation. I hope that civil society will have the opportunity to contribute towards sustainable peace and development in Nepal. Unfortunately, the fundamental human rights of many voiceless peoples are being systemically violated as a result of development projects. I have faced limitations while helping mobilize project affected peoples against the KDTL Project. Unfortunately, we don’t have the resources to mobilize while also being safe from risk. For my colleagues facing similar situations around the world, I think it is really important for us to build our capacity by accessing training and sharing experiences. This will enable us to have knowledge of the best practices and have the best tools. We can also benefit much from being plugged into and helping build a word wide network of human rights defenders. Others from outside my country can support civil society within Nepal by capacity building, including providing us expert advice, and supporting us in our strategic planning. And there is much that the World Bank and others financiers need to do in this project. They should effectively monitor and evaluate the KDTL project to ensure it respects the environmental and human rights of project affected peoples. They should ensure that communities have complete information about the project in their local language and put large billboards in all construction areas to disclose basic information about the project. It is also important that they ensure that there is an impartial dispute resolution mechanism for communities, and that resettled people are provided adequate compensation and training or jobs to restore their livelihoods. Most importantly, these financiers must respect and uphold the rights of Indigenous peoples and secure their Free, Prior, and Informed Consent (FPIC) to development projects that impact their lands or resources. From my academic courses, I have read that consultation is the cornerstone of FPIC, and FPIC-compliant development. However, neither I, nor my community, have ever been consulted about our development plans and priorities by the government, a corporation, or a development finance institution. *The author is an indigenous community member in Sindhuli, Nepal. Their name has been changed due to security concerns. Familles expulsées au profit d’un projet géothermique au Kenya. La semaine dernière, des représentants gouvernementaux des États-Unis et de toute l’Afrique se sont réunis avec des investisseurs publics et privés dans le cadre du 2ème Sommet annuel Powering Africa à Washington. Le Sommet coïncidait avec le lancement d’une nouvelle Feuille de route pour Power Africa, un partenariat pluripartite situé au se in de l’Agence états-unienne de développement international qui promet de mobiliser des ressources du secteur privé pour doubler l’accès à l’électricité en Afrique sub-saharienne. Ont participé au Sommet de trois jours des ministres de l’Énergie d’Afrique, des représentants de conseils d’administration d’entreprises et de puissantes institutions financières comme la Banque mondiale et la Banque africaine de développement. Cependant, comme il en coûtait 2000 USD par personne pour entrer, les membres de la société civile africaine en ont été exclus. Il semble que dans les accords énergétiques, l’accès à l’électricité est une chose, l’accès au pouvoir en est une autre. La dynamique entourant le Sommet de la semaine dernière met en évidence quelques-unes des difficultés de fond qui se posent à Power Africa dans son effort visant à combler un déficit énergétique immense et pressant, plus des deux-tiers de la population – environ 645 millions de personnes – n’ayant pas accès à l’électricité. Power Africa vise à produire 30,000 mégawatts d’énergie nouvelle et à élargir l’accès à l’électricité, en ajoutant 60 millions de nouvelles connexions résidentielles et commerciales. Mais il ne suffit pas de mesurer le nombre de nouvelles connexions. Il est important de savoir où ces connexions se trouvent, qui en bénéficient et si elles sont financièrement accessibles. Si Power Africa ne parle à peu près pas d’accessibilité financière, il favorise l’élimination des subventions et le recouvrement intégral des coûts – deux mesures qui risquent d’augmenter les coûts pour les consommateurs. Il est possible que l’investissement nuise au développement. La logique derrière Power Africa, c’est qu’il n’y a pas assez de ressources financières pour répondre aux besoins énergétiques de l’Afrique et les pays doivent donc mobiliser les investissements des entreprises. Et, comme l’investissement dans l’infrastructure énergétique est complexe et risqué, il leur faut rendre l’affaire plus attrayante. Dans le cadre de l’initiative, les banques de développement apportent un soutien technique aux réformes juridiques et règlementaires visant à accroître les possibilités d’investissement privé, notamment en privatisant les services publics. Selon la Feuille de route, plus de la moitié de l’électricité produite par Power Africa aujourd’hui est issue de privatisations. Mais comment Power Africa fera-t-il face aux impacts négatifs qui découlent souvent de la privatisation, tels que la limitation de l’accès et de l’accessibilité financière, la perte de revenus publics et la diminution de l’emploi de qualité? La Feuille de route de Power Africa signale que les projets devront respecter les meilleures pratiques en ce qui concerne les sauvegardes sociales et environnementales. Il n’y est toutefois pas précisé quelles sont ces politiques ou pratiques et comment on entend en assurer la mise en œuvre et le suivi. Comme l’a souligné la Communauté de Narasha, « laisser les activités [de développement] aux mains du gouvernement national ne garantit aucune protection ni atténuation des effets. » En particulier, il est essentiel que Power Africa intègre des mesures visant à détecter et gérer les risques et les impacts sociaux, notamment ceux liés aux droits humains. Qui contrôle l’énergie et qui en bénéficie ? Pour réellement assurer l’accès à l’énergie et le développement, Power Africa devrait être dirigé par ceux qui sont censés en être les bénéficiaires. Selon sa Feuille de route, Power Africa entend veiller à ce que les promoteurs de projets « tiennent compte de l’ensemble des besoins et des préoccupations de ceux et celles dont la vie et les communautés seront les plus touchées. » Mais il n’est pas dit comment cela devrait se réaliser. 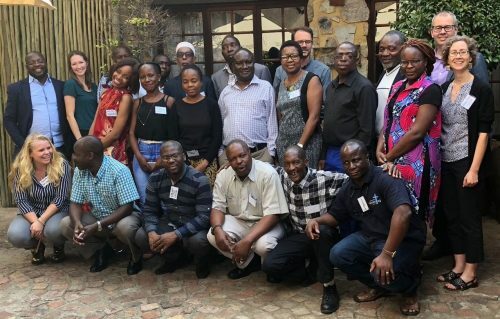 Power Africa doit se doter de mécanismes permettant d’assurer une communication systématique et continue entre les porteurs de projets, les financiers et les communautés locales de sorte que les communautés aient réellement accès à l’information et soient en mesure d’influencer les projets qui auront une incidence sur elles. Tout comme Power Africa se targue d’avoir une trousse à outils pour les gouvernements et le secteur privé, il faudrait donner aux membres de la société civile les outils leur permettant d’avoir accès à l’information, de comprendre les contrats et les budgets, de négocier avec les entreprises, d’influencer les projets de développement, de concevoir leurs propres projets énergétiques communautaires, de surveiller les impacts et les revenus et de défendre leurs droits fondamentaux. *this post originally appeared in English at rightingfinance. Two weeks ago, at the United Nations’ fourth Annual Forum on Business and Human Rights, multi-stakeholder groups discussed ongoing challenges and trends in implementing the UN Guiding Principles on Business and Human Rights (UNGPs). While the discussion around business and human rights has tended to focus primarily on States and the private sector, it is beginning to explore a critical area where these two entities increasingly converge – development finance. A new factsheet from the Coalition for Human Rights in Development and the International Corporate Accountability Roundtable explores the myriad reasons why development finance matters for business and human rights. Here, we’ll explore just a few. First, if you follow the money behind a corporate activity, in many cases you’ll find it leads to some form of development finance – official development assistance, national and multilateral development banks, or other Development Finance Institutions (DFIs). Development finance to the private sector takes many shapes. Development banks provide direct loans and credit lines to corporations, and can even be equity investors in private businesses. Development banks are also increasingly lending through financial intermediaries like commercial banks and private equity funds, which then “lend-on” funds to their clients. More and more, States are relying on the private sector to meet their development objectives, including through public-private-partnerships for the provision of public services or infrastructure development. Second, the projects financed by DFIs often raise significant potential for corporate human rights abuses. Projects often take place in countries or contexts in which the rule of law and institutional capacity regarding human rights are weak. A lack of accountability and inadequate human rights due diligence standards within DFIs creates the potential for human rights abuses by corporate actors. 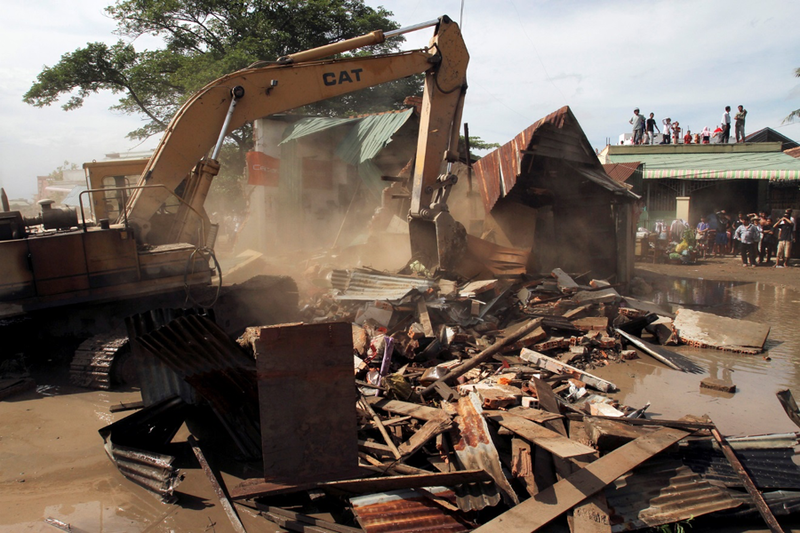 The International Finance Institution’s (IFC) corporate clients, for instance, have recently been linked to various human rights abuses – from forced evictions to killings. Third, with robust due diligence, development finance can help to raise the bar for corporate conduct and prevent human rights abuses. Civil society has made significant strides over the years in securing operational policies within DFIs, especially multilateral development banks. These standards place requirements on business activities, ranging from consultation with local communities and disclosure of project information, to protections for workers and indigenous peoples. Fourth, DFIs can provide accountability avenues for those who have suffered human rights abuses as a result of corporate activities. Communities challenging business activities financed by development banks may be able to file a case with a bank’s independent accountability mechanism to secure redress or gain leverage in negotiations. Advocates have also successfully targeted DFIs as a strategy to gain increased media attention and political traction for a given human rights campaign. Finally, the policies and standards adopted by large financial institutions like the World Bank and the IFC often have an enormous ripple effect globally. The World Bank’s resettlement policy, for example, has been adopted by governments and used by communities as a model to demand better treatment in the absence of adequate national regulations. The IFC’s Performance Standards on Environmental and Social Sustainability are globally recognized good practice and serve as the basis for the Equator Principles, which have been adopted by nearly 80 banks and financial institutions. The World Bank presently is revising its entire suite of social and environmental policies. By taking advantage of opportunities to strengthen the human rights coherence of DFIs, business and human rights advocates can influence corporate conduct at a global level. The UNGPs apply to both the supply and demand side of development finance in a variety of ways. States’ duties to respect and protect human rights, for example, apply to States’ actions as recipients of development finance, as financiers, and as decision-makers within multilateral and domestic DFIs. Principle 4 for instance, speaks to the duty of States to take additional measures to protect against human rights abuses by business enterprises that receive substantial support and services from State agencies, including by requiring human rights due diligence. Principle 8 declares that States should ensure that government agencies and State-based institutions that shape business practices are aware of and observe the State’s human rights obligations. Principle 10 declares that when States act as members of multilateral institutions that deal with business related issues, they should ensure that those institutions do not restrain the ability of member States to meet their duty to protect or hinder the ability of business enterprises to respect human rights, and should encourage those institutions to promote business respect for human rights. 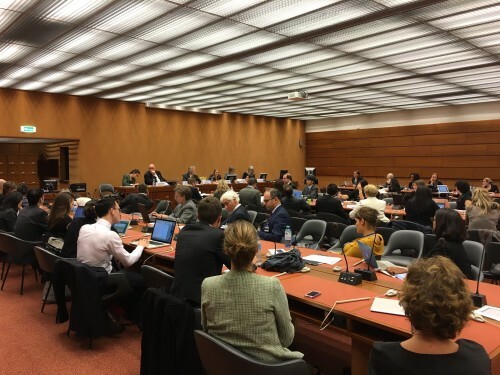 The UN Human Rights Council has called on all Member States to implement the UNGPs through the development of National Action Plans (NAPs), and civil society in many countries is now using the NAPs process to strengthen national regulatory frameworks for corporations. NAPs, however, also present a valuable tool for strengthening the human rights coherence of development finance. Of the States that have completed NAPs, the majority have addressed development finance or public financial institutions in some way. Finland committed to promoting human rights within international development organizations; Sweden will encourage multilateral institutions like the World Bank to promote corporate respect for human rights; and Spain will coordinate with international financial institutions to strengthen access to remedy. However, the potential for using NAPs to shape development finance is much greater still. As civil society organizations make recommendations for NAPs, many are including specific proposals toward this end. These include proposals that States mainstream human rights in the policies of the World Bank and other international financial institutions; ensure that international financial institutions have proper procedures and tools in place to guarantee effective remedies when abuses do occur; make certain that development banks providing credit or insurance follow the UNGPs; and require national development agencies’ private sector partners to undertake human rights due diligence. The Coalition for Human Rights in Development has put together a discussion memo to provide examples and generate discussion around how NAPs can promote human rights due diligence within development banks and other public financial institutions. As development finance becomes more intertwined with the private sector, the business and human rights community can play a critical role in helping to define and strengthen human rights due diligence standards and practice within development finance. This work will involve campaigning and advocacy targeted at development finance institutions and at national governments. It will also require support for frontline communities engaged in defending their rights in the face of harmful development projects. Working together we can reinforce our common human rights objectives and achieve greater success at holding corporations, States and DFIs accountable and ensuring that human rights are respected and protected. by Gretchen Gordon, Coordinator for the Coalition for Human Rights in Development, and Stephanie Mellini, Research and Advocacy Fellow with the Coalition. *this post originally appeared on the UN Forum Series of Measuring Business and Human Rights. Every year countries receive and spend over $100 billion in loans and grants from development banks like the World Bank. These investments may go to any number of activities, from infrastructure projects, to social services delivery, to policy reforms. These investments may go to any number of activities, from infrastructure projects, to social services delivery, to policy reforms. his development finance can have a critical impact on the enjoyment of human rights in a host country – positive or negative. So how are these critical decisions around development finance made? Decisions like what loans are taken, what sectors of the economy are prioritized, how a specific development project will be designed or implemented. In much of the world, these decisions are made behind closed doors, with little to no public input or accountability. This blog is part of a series highlighting the work that members of the Coalition for Human Rights in Development are doing to change the way development decisions are made within their countries and to ensure that the development process is transparent, participative, accountable, and rights-respecting. 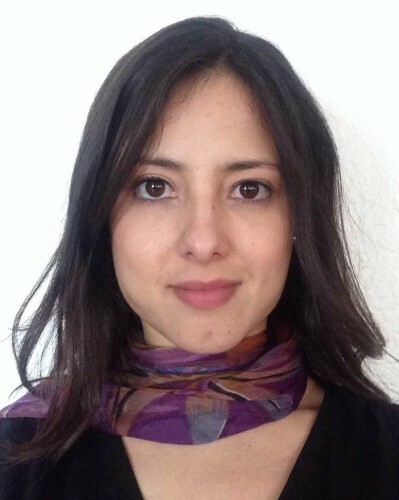 We spoke with Mariana González Armijo, Researcher on Transparency and Accountability at Fundar, an organization located in Mexico which works to transform the relations of power between society and government, to encourage a society that is fair, participatory, and respects people’s human rights. Q: What change would you like to see in how Mexico engages with development finance? A: Our main goal is to secure strong standards on transparency, to guarantee that human rights are respected within development finance, and to make it more clear what our government is doing in the name of development with all the resources it expends. This is important since in many cases development projects end up increasing inequality and don’t achieve the outcomes they had promised in the first place. First, we are working on a diagnostic which exposes the lack of transparency around the loans that Mexico accepts. Mexico is one of the main clients of the World Bank and the Inter-American Development Bank, with 9.2% and 18.83% of the global portfolios, respectively. Most of the time, once resources from development banks enter Mexico, they’re merged with the federal budget, so there is no way to track them. One step to guarantee that the money doesn’t go to a project that violates human rights is to make the loans transparent. Additionally, we have worked on a strategy with other CSOs to increase the transparency around financing in the area of climate change. Many IFI loans are going into climate change, but there are no specifics on national budget documents identifying where the money is coming from. If we succeed in getting this transparency around climate projects, we may be able to expand it to other sectors. At a broader level, we analyze public policies and enhance national-level normative frameworks related to the implementation of development projects. For example, regulations relating to energy reform, public private partnerships, and environmental assessments have a huge impact on development projects implemented in Mexico. Finally, we conduct research on specific development projects, working with communities to enhance their capacity to defend their territories and rights, providing technical assistance and using strategic litigation at the national level. A: The right to information is necessary to guarantee the realization of other rights. Once a community has information regarding projects that are going to be implemented in their territory, then they can decide if they want to be consulted or participate in projects that are going to affect them. Participation is important because it can guarantee the right to consultation and consent. Q: Have you had any successes engaging with your parliament or finance ministry or other ministries regarding development finance decisions? A: This has been one of our major challenges. One strategy we have is talking directly with the Finance Ministry. Another strategy is to advocate for changes within the Federal Income Law. 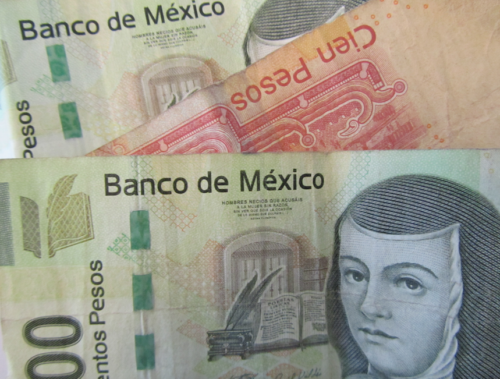 Mexico’s Federal Income law is the instrument which defines the ceiling for external debt, including loans from IFIs. So we have tried to put an article in that law to oblige the government to provide details regarding where money is coming from, what specific projects it will be used on, and who will be responsible for implementing each project. Q: What are the biggest challenges you face in this work? A: One challenge is the fact that development finance is such a technical theme, so it can be difficult to communicate and to bring in other partners. We have to make the link between development finance and other agendas, such as health and women, from a human rights perspective. If we can manage to make these critical linkages, it is easier to have a stronger impact. 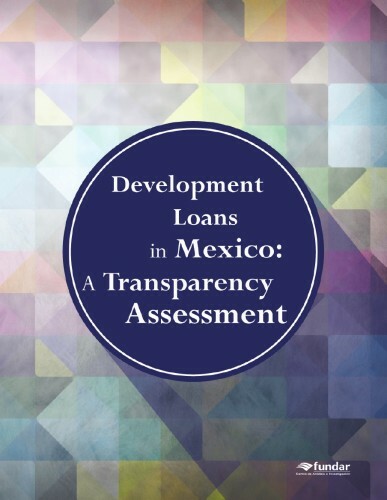 A: In September we released our diagnostic: Development Loans in Mexico: a Transparency Assessment. The report attempts to clarify the legal framework that governs the flow and execution of Mexico’s development loans; the type information that is available on these loans; and which information, when requested, is supplied by the Mexican government. It was shocking to find from this assessment that we have a really strong constitutional level framework around development finance; the government is just not complying with it. The assessment shows the lack of transparency around development loans and will help us to advocate for a specific mechanism at the national level to allow citizens to track the resources coming from IFIs. * Responses may not be exact quotes. Earlier this month at the 7th BRICS Summit in Ufa, Russia, the BRICS countries (Brazil, Russia, India, China, and South Africa) inaugurated a new multilateral financial institution. BRICS Heads of State pledged that the boldly named New Development Bank (NDB) will be a driving force for South-South cooperation – a development bank that can deliver for emerging and developing economies where the traditional banks like the World Bank and Asian Development Bank have failed. Unfortunately, merely calling something “new” or “better” doesn’t make it so. Creating a global bank that is able to provide real development for the Global South requires much more than a good name. It requires a new model of development. But the first key question for many is not whether the NDB will provide an alternative to the predominant development banks, but whether it can provide an alternative to the predominant development model. 1) Promote development for all: financing inclusive, accessible, participative development that is driven by communities, reduces poverty and inequality, removes barriers to access and opportunity, and respects human rights, local cultures, and the environment. 2) Be transparent and democratic: ensuring that development policies and operations are accessible and that the development process engages communities and civil society in choosing, designing, implementing, and monitoring NDB projects. 3) Set strong standards and make sure they are followed: adopting standards and accountability mechanisms based on human rights and environmental best practice to ensure that development activities do not harm communities or the environment. 4) Promote sustainable development: supporting environmentally sustainable, long-term solutions and climate resilience, and respecting communities’ land and resource rights. While the NDB officially opened for business last week, the BRICS still have not spelled out what they mean by “infrastructure and sustainable development” and the bank does not yet have an operational policy framework. So the second million dollar question, or in this case, the USD 50 billion question, is what type of development will the NDB deliver and how? As many commentators have pointed out, the BRICS’ firm embrace of resource-intensive megaproject development both at home and abroad does not inspire hope for the social and environmental impact of the NDB’s investments. Large infrastructure projects carry extensive human rights and environmental risks, especially where domestic legal frameworks are weak or enforcement capacity is low. Unfortunately, several BRICS and NDB officials have expressed a distinct disdain for lending safeguards or standards which might provide a minimum safety net, viewing them as conditionalities or overly rigid. At the same time, many of the BRICS countries have strong domestic social and environmental legislation which could be used to argue for parallel protections in NDB operations. China has in recent years strengthened its regulatory framework for overseas investments, and has strongly encouraged compliance with international norms and best practice. Chinese officials pledged that the new Asia Infrastructure Investment Bank will embody “the highest standards”. These developments indicate some openings for the NDB. With the NDB now officially inaugurated, and its first projects expected to be approved in early 2016, the institution will have to establish a clearer direction and policy framework. At a minimum, this provides civil society the chance to influence the institution from its inception, and hopefully to incorporate some of the lessons learned from decades of fighting the World Bank and other IFIs. While the BRICS summit in Ufa has finished, the real work continues. In BRICS countries, civil society groups are pushing their finance ministries and parliaments to try to influence the NDB’s direction and policy framework and to shape the concept of what real development is. 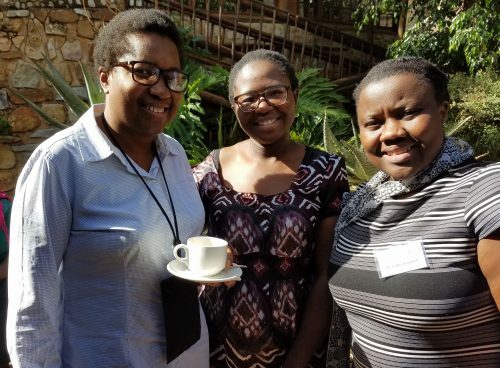 Thanks to advocacy from civil society groups like the Centre for Applied Legal Studies, South Africa’s parliament issued instructions to the South African department of finance to promote human rights through BRICS processes. 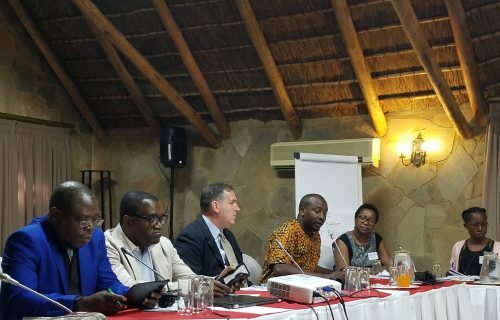 Through the Bank on Human Rights Coalition and other fora, BRICS civil society groups are strengthening their connections with each other, as well as with counterparts in non-BRICS countries, in order to share strategies and enable coordinated advocacy. Another critical area of work is ensuring that frontline communities who will bear the greatest impacts from NDB projects have the resources and solidarity they need to advocate for their development priorities and to defend their rights. The coalition-building by communities and civil society groups around BNDES, the Brazilian national development bank, and around Chinese overseas investment, is growing stronger, connecting communities impacted by foreign banks with national groups in the banks’ home countries. These connections and collaborations provide a strong foundation for building the solidarity necessary to shape the NDB and its investments and to hold it accountable. While we cannot hope the New Development Bank will be something new or better just because it has a clever name or because different flags fly outside its offices, we can continue to fight for a new model of inclusive, community-led development that respects human rights, regardless of the bank signing the check. Gretchen Gordon is Coordinator of the Coalition for Human Rights in Development, a Coalition of social movements, civil society organizations, and community groups working to ensure that all development finance institutions respect, protect, and fulfill human rights. Deepika Padmanabhan is an intern with the same Coalition. Right now, your government is likely making important decisions related to development finance. Whether it’s the establishment of new institutions like the BRICS New Development Bank and the Asian Infrastructure Investment Bank, or policy developments like the revision of the World Bank’s Safeguards or priorities for your national development bank, governments are making decisions that will impact how development activities are designed and implemented, and whether they actually benefit communities and the environment, or instead, cause harm and increase poverty. In order to assist civil society groups in investigating how their governments make decisions regarding development finance, and to ensure that these processes are transparent and respect human rights, the Coalition for Human Rights in Development put together the attached: Questions to ask your government regarding development finance. You may adapt this questionnaire for use in your advocacy. Please share the responses you receive, and to let us know if you have any suggestions for improvements.